Second World War in Northern Ireland - County Down Part 5. S.A.S. Trooper from Moira Murdered by the Gestapo. 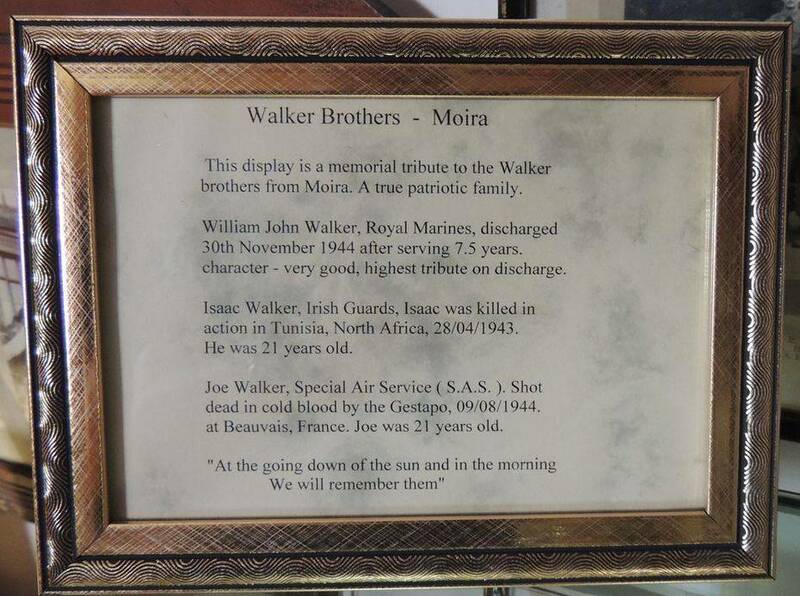 The Murder of Joseph Walker, Special Air Service by the Gestapo. The Unit had been divided into two groups with all of the Northern Ireland soldiers being with Captain Garstin and Lance Corporal Vaculik who was Free French. 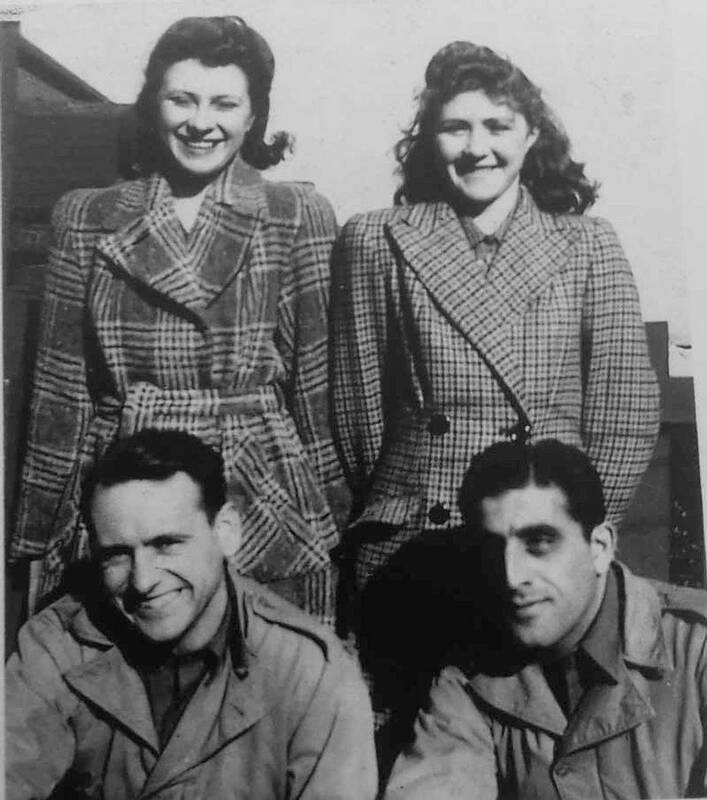 French Resistance Fighters had been informed of the parachute drop however two of them believed that a third, who used to take used parachutes and sell them in Paris, was missing for some time and may have been captured by the Gestapo. On the previous night of 3rd / 4th July a coded BBC radio message had been received by the Resistance Fighters telling them of a Parachute Drop however on that occasion the flight was cancelled with insufficient time to inform the French. Ominously while they waited at the Drop-Zone some automatic gunfire was heard in the area. At 01.53 the S.A.S. parachuted from the aircraft with most landing on the Drop Zone, which was a field of wheat, whilst the final five to jump had landed in a Wood. At the edge of the D.Z. was a group of men wearing civilian clothes who greeted Captain Garstin with the words “Vive la France” immediately after which the soldiers came under fire from automatic weapons. There was a brief exchange of fire however it soon became obvious that the S.A.S. were surrounded and subsequently Vaculik was captured at 06.00 and Corporal Jones an hour later. 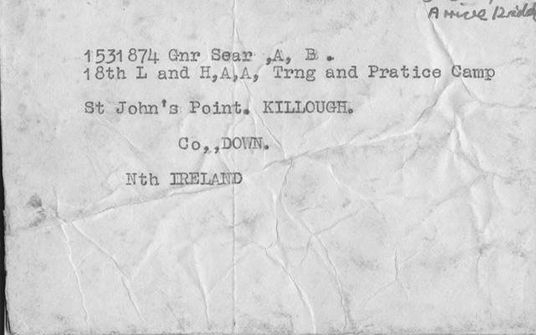 - They soon learned that Captain Garstin, Lieutenant Wiehe, Trooper Thomas James “Tot” Barker (Previously of the Royal Inniskilling Fusiliers and from Cookstown, County Tyrone) and Lance Corporal Howard Lutton (Who had been Army Air Corps and from County Armagh) had also been captured after being wounded. Lance Corporal Lutton subsequently died of his wounds and is buried in Clichy Northern Cemetery. 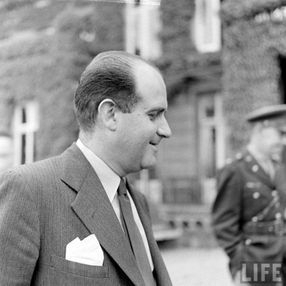 Captain Garstin and Trooper Barker received hospital treatment for their wounds whilst the other men were initially taken to a converted Hotel near Champ de Mars in central Paris and then a Gestapo Headquarters where they were kept and interrogated for three days before being returned to the converted hotel. A day or two later Captain Garstin and Trooper Barker were reunited with the other soldiers however Captain Garstin was very weak. 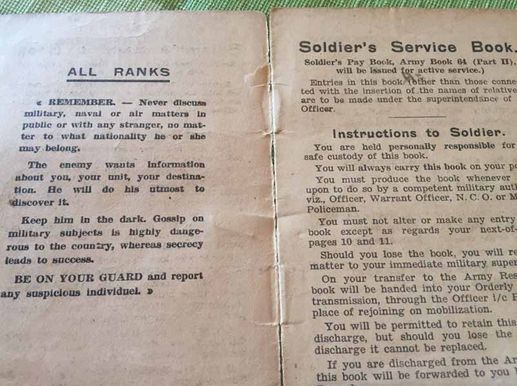 On 8th August all of the soldiers were given civilian clothing and told that they were to be exchanged for German Agents who were held by the British in London and that they were required to wear civilian clothing to ensure that they could pass through civilian areas. At 01.00 the following morning all of the men were told to board a lorry and were driven north of Paris. About five hours later they reached a Wood which was East of Noailles and here they were ordered out of the lorry and told to walk along a narrow path to a clearing in the Wood. Corporal Vaculik asked if they were to be shot and received a reply to that effect. The S.A.S. 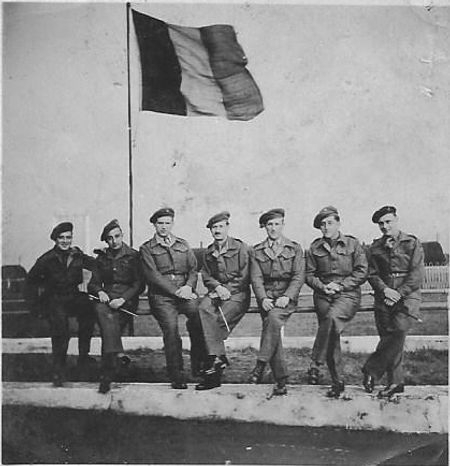 men were lined up from left to right Jones, Captain Garstin, Corporal Vaculik, Varey, “Tot” Barker, Joseph Walker (From Moira, County Down) and William Pearson “Billy” Young (Previously Royal Ulster Rifles and from Randalstown, County Antrim), although it is not certain if the order was Barker, Walker or Walker, Barker. Facing the men were a number of Gestapo. Two Officers who were armed with Sten guns at the ready whilst another read out the Sentence. A Sergeant of the Gestapo who translated and a Gestapo Agent in civilian clothes. On hearing the word “Shot” all of the men tried to escape into the woods. Corporal Vaculik managed to get away while Corporal Jones tripped and fell. The Gestapo men ran past him thinking he was dead and when he got up again he saw four bodies lying where they had been shot but could not identify them before he tried to escape. This Incident was investigated by Captain Sadler and Major Poat of the S.A.S. who visited Noailles around 20th September and on speaking with the local Resistance Leader he showed them where he believed the murders had taken place and also where the bodies of the S.A.S. soldiers were buried. A grave had been dug in a wooded area about two miles from where the shooting had taken place and near a large chateau that is approximately one mile to the east of Noailles. 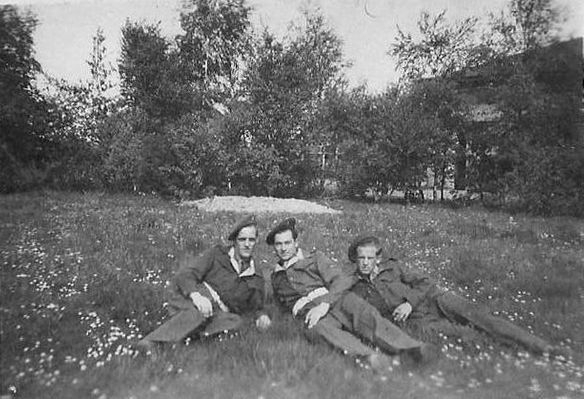 The Resistance fighter said that the Germans had a two day Curfew in place following the shooting and were searching for the bodies of Soldiers Jones and Vaculik. The bodies of 5 murdered S.A.S. men lay at the scene for three days before finally being buried by a German Army Unit consisting of one Officer and approximately nine men who had been in the Chateau. During the Investigation it was necessary to open the grave and on doing so a total of five bodies were found. All of them were dressed in civilian clothing and showed signs of having been handcuffed. One of the bodies was identified as that of Captain Garstin. All of the bodies were subsequently buried in Marrissel Cemetery at Beauvais with Captain Garstin being grave number 325 and the others 326 - 329. 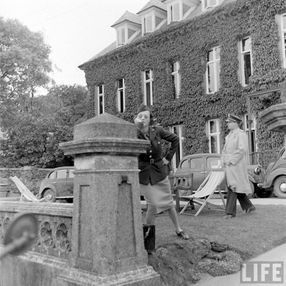 The Gestapo had tried to conceal their actions so the Investigation looked into the Germans who had occupied the Chateau who had buried the bodies. 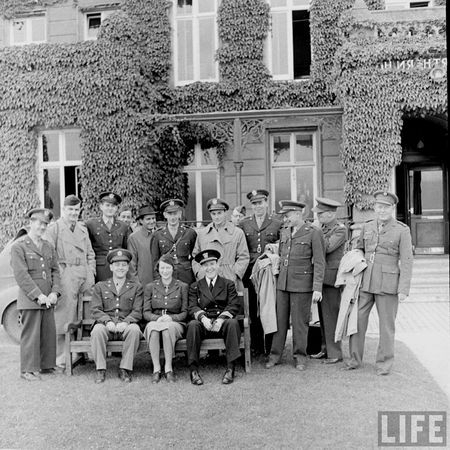 A woman Collaborator, who had worked for the Germans in the Chateau and believed that they had been a Luftwaffe Signal Section, identified a number of the soldiers including Captain Hans Garling, Officer Hans Zool and Oberfeldwebel Gall. Joseph Walker was one of three Brothers who joined the Armed Forces so I am continuing this story below. 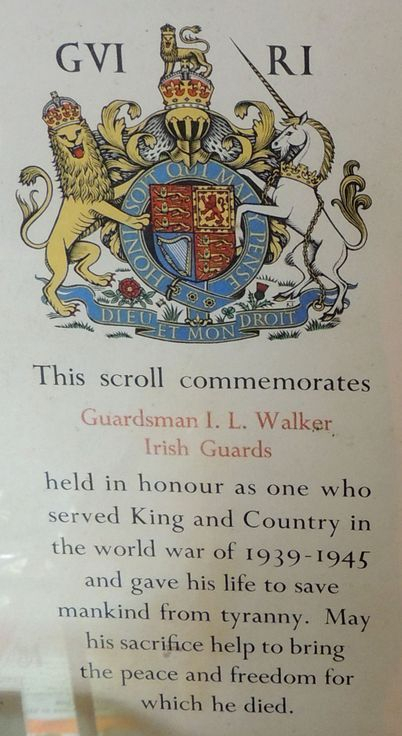 Isaac Walker had joined the Irish Guards and was 21 years old when he was Killed in Action in Tunisia, North Africa on 28th April 1943. 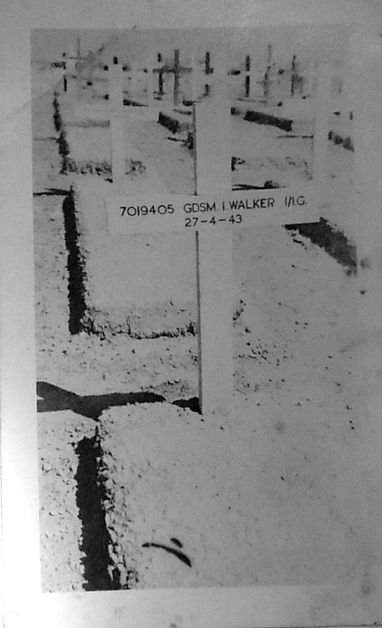 Joseph Walker's Headstone in Marissel French National Cemetery, Beauvail which is between Amiens and Paris. 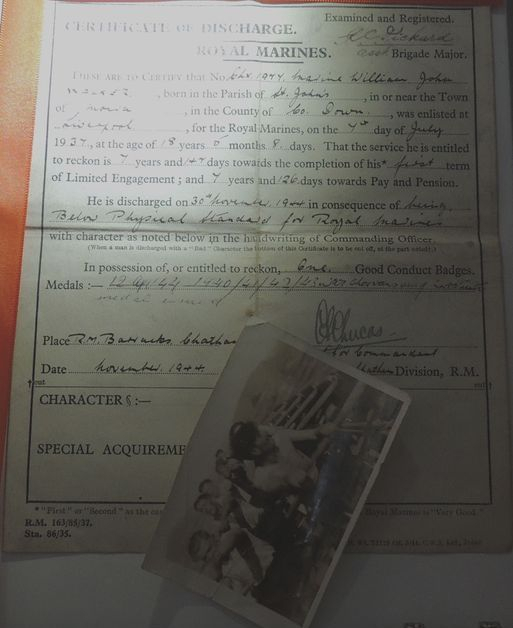 William John Walker served with the Royal Marines and was discharged in 30th November 1944 with 7 1/2 years service. 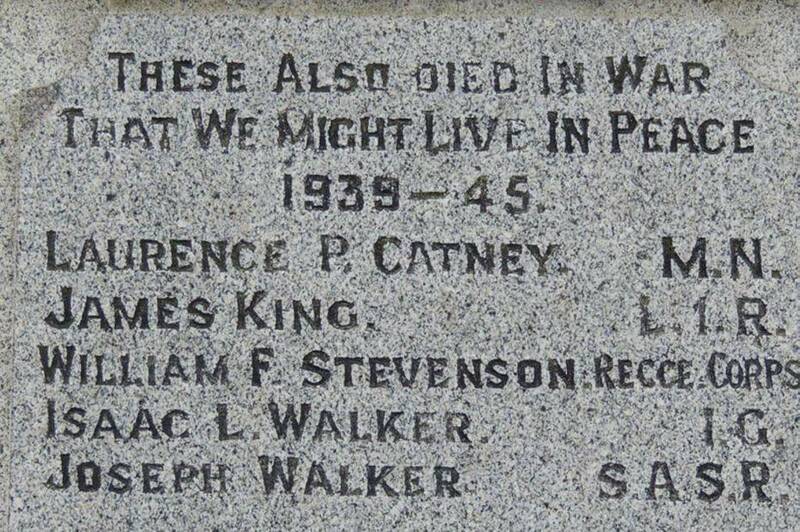 The War Memorial at the front of St John's Church of Ireland in Moira has the name of Joseph Walker as shown above. 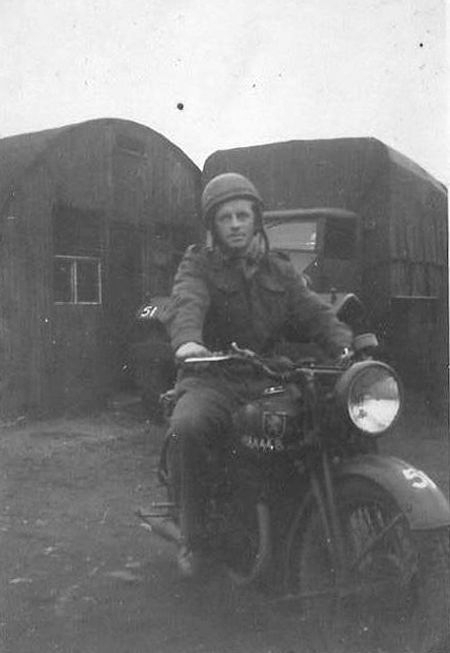 John Leishman served with the 51st Highland Division during the Second World War. 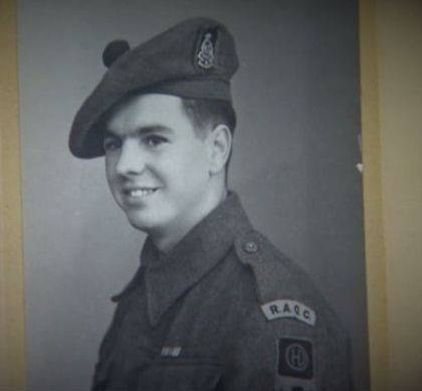 He was born in Falkirk, Scotland and joined the Argyll and Sutherland Highlanders at Sterling Castle on the day the United Kingdom entered the war on 3rd September 1939. 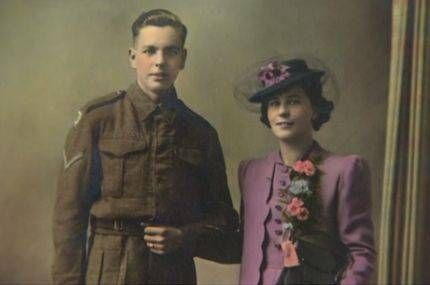 It was when he was serving in Northern Ireland that he met the woman who was to become his Wife in 1941 - Florence. 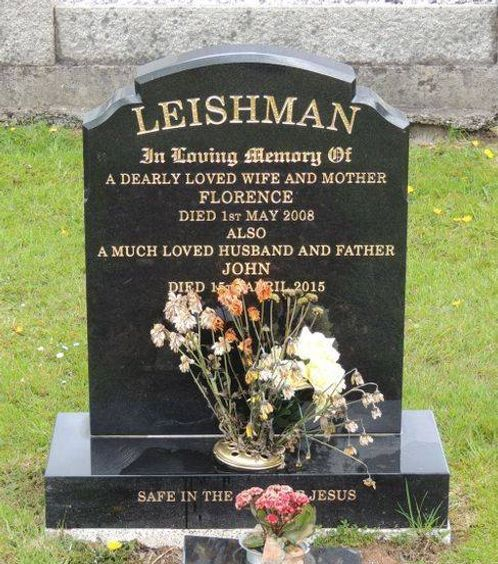 John served in the Lisburn, Donacloney, Waringstown and Moira areas on Northern Ireland. 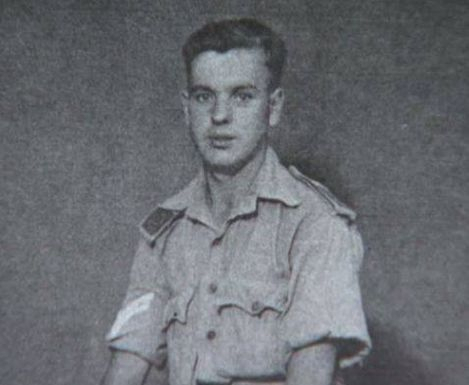 He was evacuated from Dunkirk with the British Expeditionary Force and saw action with the 8th Army in North Africa as well as being involved in the Italian Campaign. On D-Day he landed at Sword Beach in Normandy. 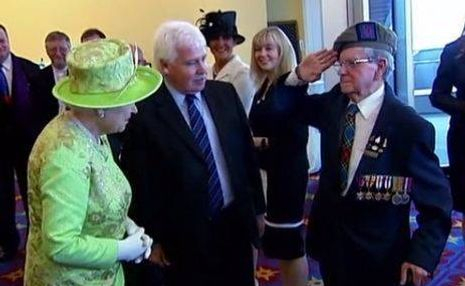 Some years ago he met Queen Elizabeth in Belfast and took the opportunity to remind Her Majesty that when she was serving in the A.T.S. She had changed the spark plugs on a car he was driving! 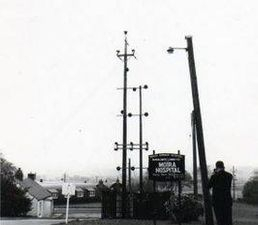 Waringfield Military Hospital was constructed during 1942 and was opened in June of that year as a 900 bed Convalescent Hospital. 5th General Hospital Emergency Medical Service Detachment of 2nd General Hospital arrived from Oxford to replace 5th General Hospital who had been there from the opening of the Hospital. A video of the old Hospital can be seen by clicking on the link below. 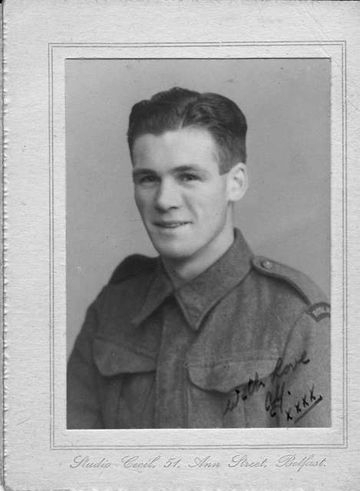 Roy Whittaker was serving with 4/5 East Kent Yeomanry. 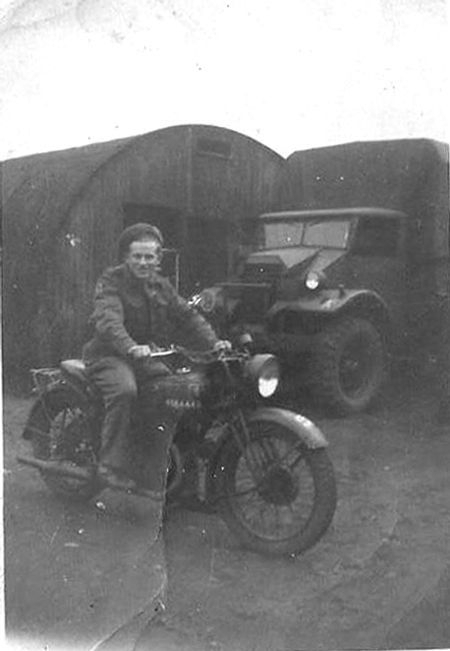 He was a medic and arrived at Waringfield Hospital in 1946/7. 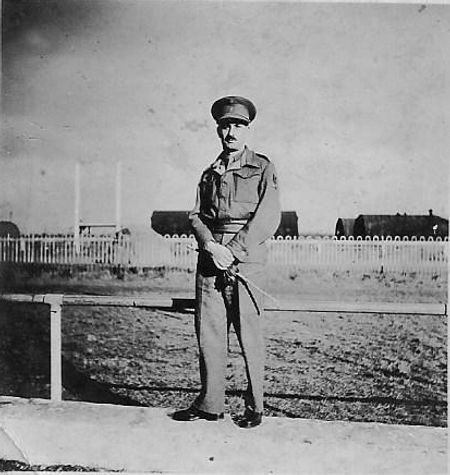 During his time at Waringfield he assisted in treating Soldiers who had been held Prisoner of War by the Japanese in Burma. 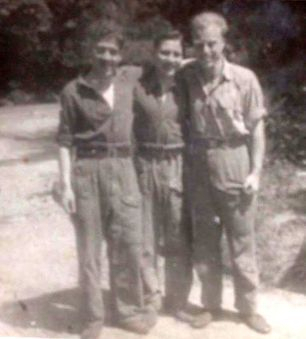 The three Scottish Soldiers shown below had been P.O.W's in Burma and are shown in Waringfield. 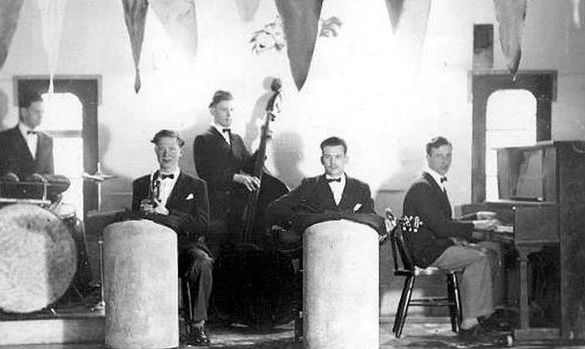 Roy Whittaker is playing in the Dance Band which is photographed whilst performing at Waringfield Hospital. In the top right of the photograph above can be seen the Water Treatment Plant for the Hospital. - Some of these structures still remain and can be seen below. 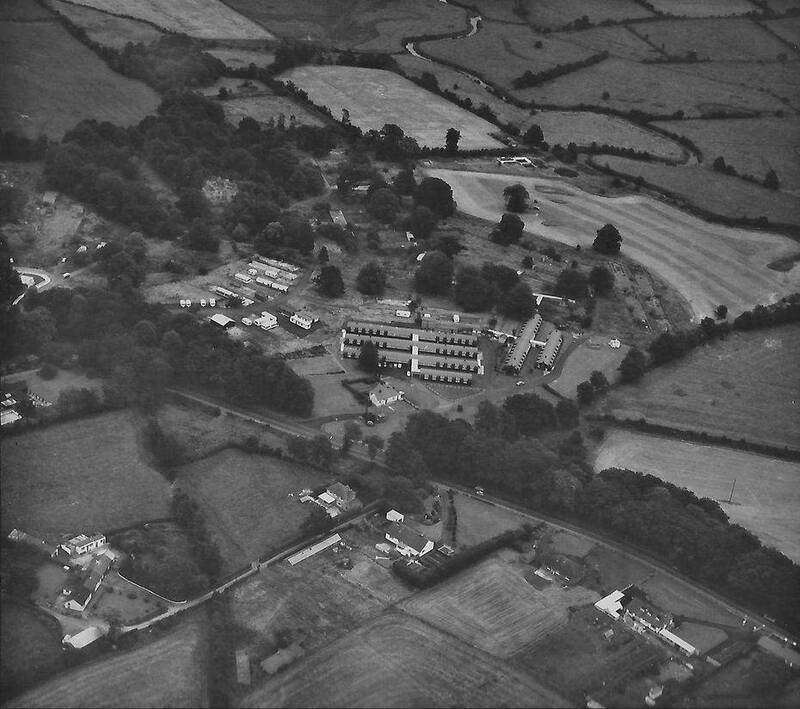 The top aerial photograph shows the Waringfield Hospital site (From Moirahistory.uk) while the colour photograph shows the buildings after the war. 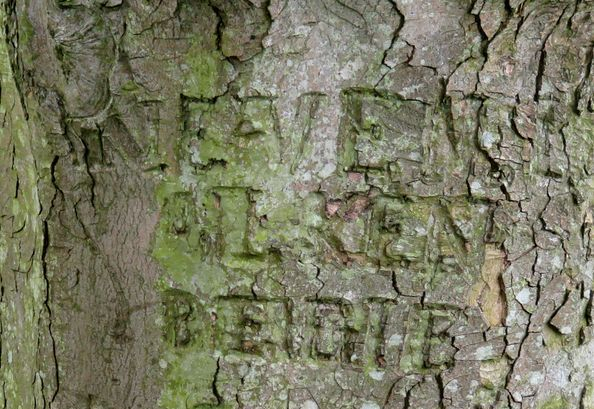 These two trees have some Second World War graffiti on them. The one on the right has "Victory" written twice - Both across and down whilst the picture above says "Neeven Alken Belgie" - Neeven is a Belgian Surname with Alken being a town to the East of Brussels in Belgium. Donaghadee and the sinking of "Miss Betty"
On 8th May 1943 the Pilot Vessel "Miss Betty" left Bangor at 09.55 to assist a ship entering Belfast Lough. 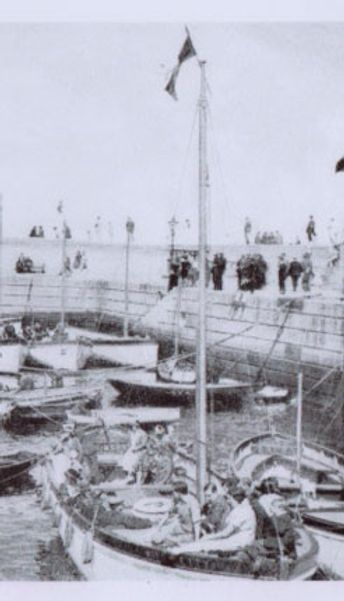 The "Miss Betty" was owned by The Admiralty and crewed by Harry Aiken of Bow Street, Donaghadee, William George Nelson of East Street, Donaghadee and William White of Mount Street, Donaghadee along with William Anderson of Crosby Street in Bangor. The crew consisted of Aiken as Deckhand, Nelson Coxwain, White as Pilot and Anderson was the Engineer. The boat had been experiencing heavy seas and finally at 11.30 it was struck broadside by a wave and capsized with the loss of all hands. 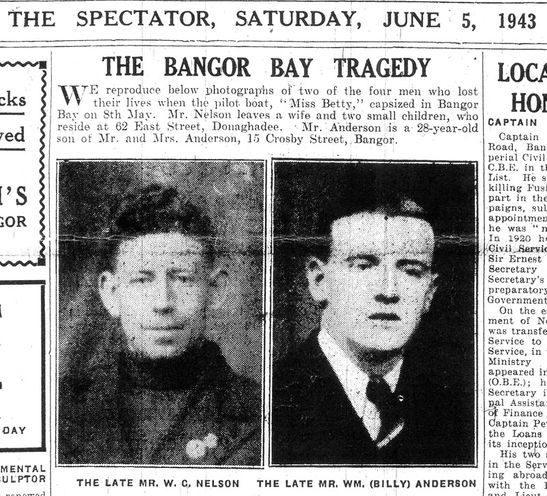 Three bodies were recovered in Bangor however the body of William Anderson was washed ashore in Portpatrick and he is remembered on the Bangor War Memorial as shown below. 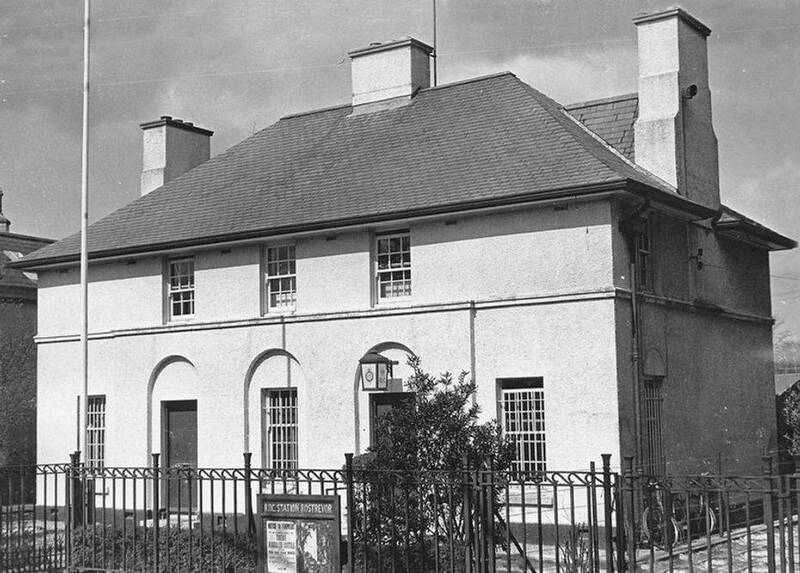 Donaghadee Orange Hall was used as a billet by the Army during the war.Various Units passed through including the Royal Inniskilling Fusiliers. 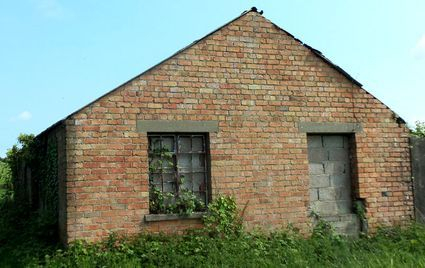 The old red bricked building has now gone however the original stone remains. 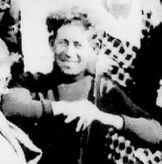 Shown here are Donaghadee girls Jean Lock, nee Somers on the left with Mavis Warden, nee Tollerton on the right. 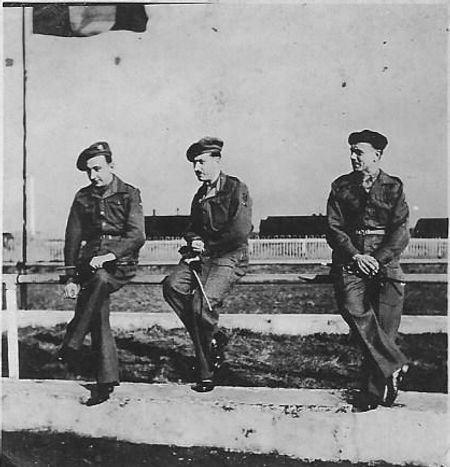 The American Soldiers are Bob Leishman on the left and Frank Kouri to the right. 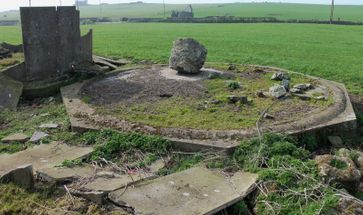 The Anti-Aircraft Gun Battery at Ballysallagh consists of two Gun Positions in which all of the Ammunition Storage structures have been removed. 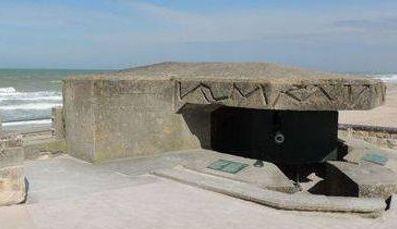 A small shelter can be seen at each position, which would have held one gun, and the concrete base of the control building can still be seen. 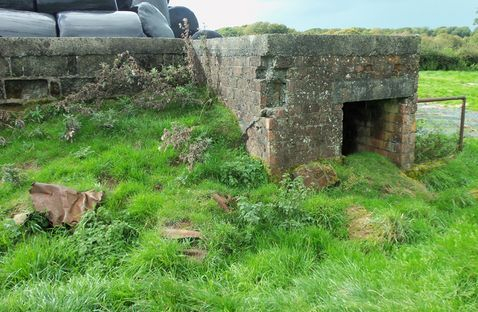 The top photograph shows one of the gun positions complete with its shelter. 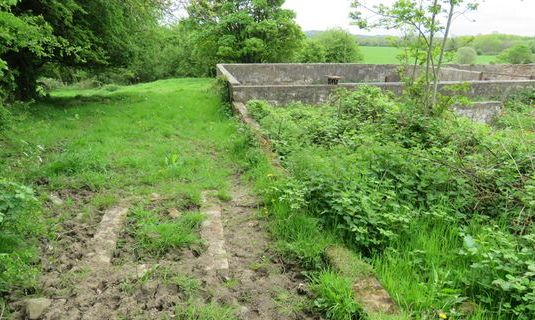 Above is the concrete base of the Command Building and the second of the two gun positions. 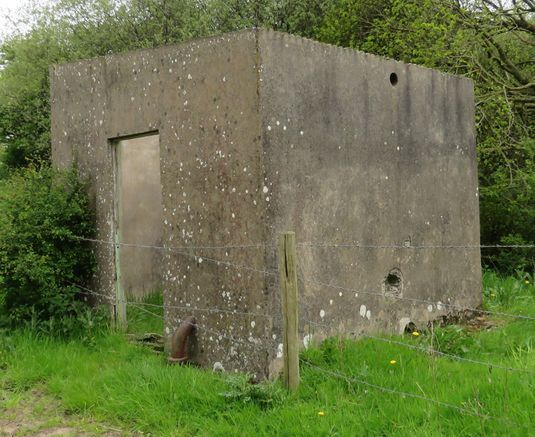 - Like the first this has had the Ammunition stores removed and has a similar shelter. 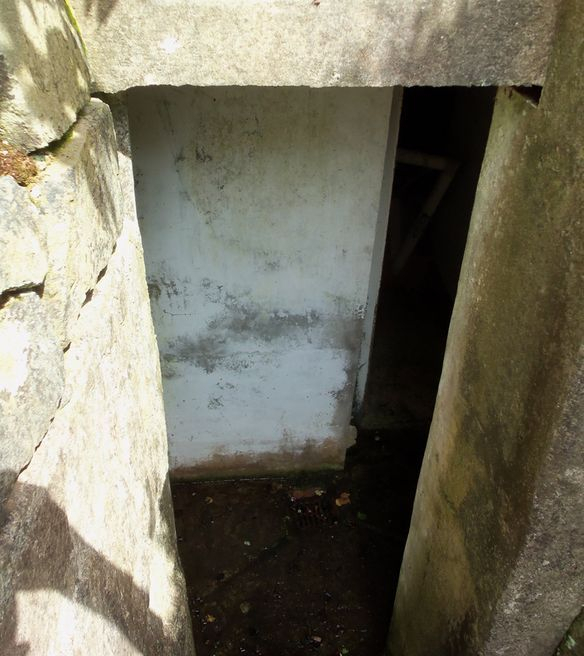 On looking into this shelter you can see that the access ladder has fallen inside. 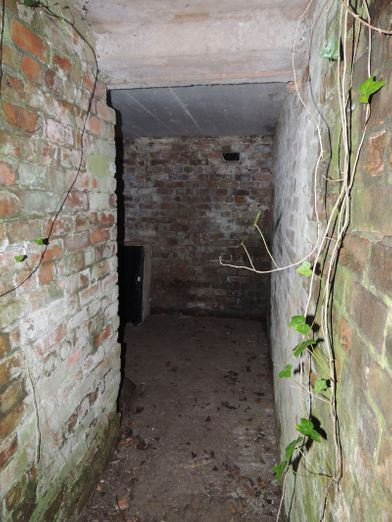 These pictures show an Air Raid Shelter which is situated in the garden of a house in Helens Bay. 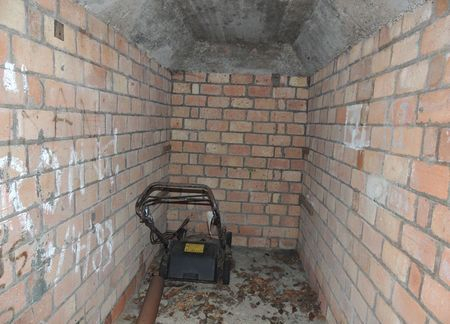 The first picture should give some idea of how deep underground it has been constructed with the second showing a closer view of the entrance and single room behind. As with virtually all the shelters I have been in the interior has been painted white. 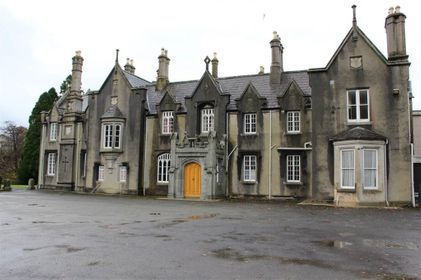 Craigdarragh House at Helens Bay was used as an Army Camp with a large number of soldiers living in the grounds however the same camp was later used to house Prisoners of War. 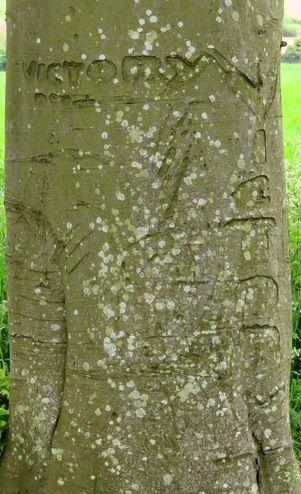 This small copse and memorial stone was laid to remember members of the Campbell College Scout Troop who were killed during the Second World War and can be found at the Scout Camp at Crawfordsburn Country Park. 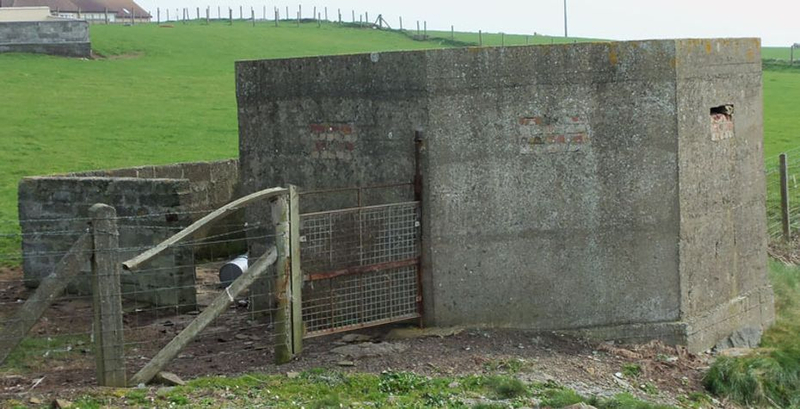 Here are three Air Raid Shelters built close together off Ballyrobert Road. 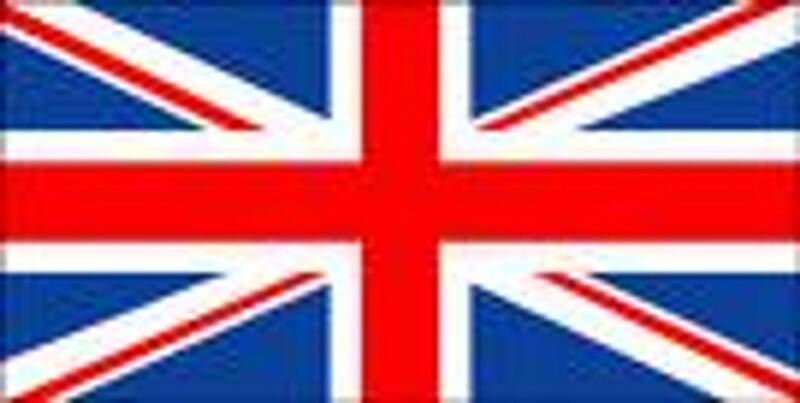 One has had its inside painted white and there may have been a Union Flag painted on the narrow wall. 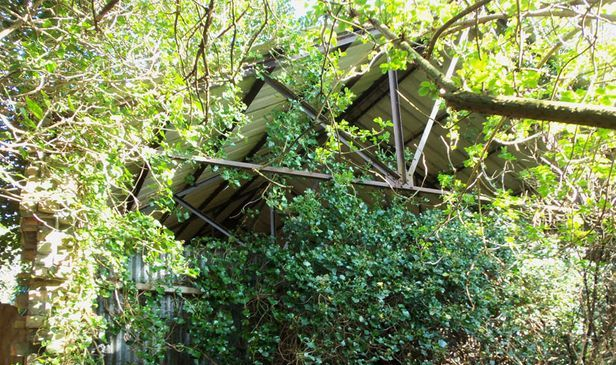 Such shelters were often painted white to provide as much brightness as possible at times of Blackout due to Air raids. 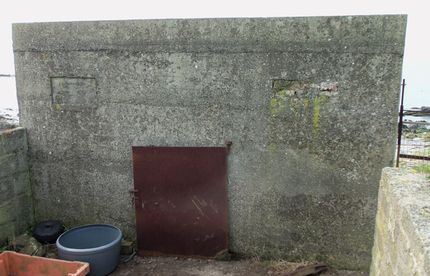 On the right you can see that the shelter is in super condition and interestingly these buildings are the same design as those which can be seen at Ballyvester near Donaghadee. 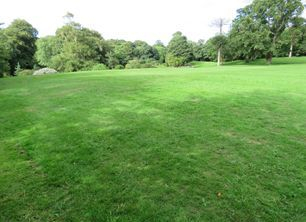 Beside Crawfordsburn Country Park is what was Crawfordsburn House. 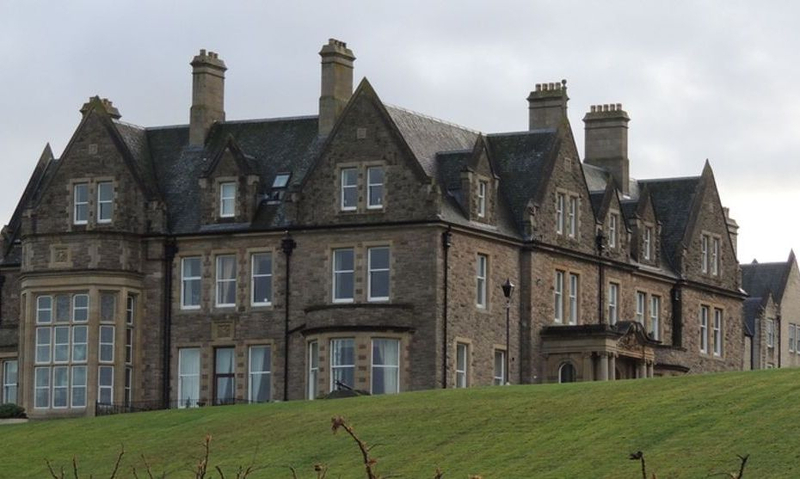 It is now private dwellings however during the Second World War there was a Military Camp in this area with soldiers living in the field beside the old windmill at Old Windmill Road and others, perhaps Officers, residing in the large Crawfordsburn House which is shown here. This is an interesting example of how the war effort affected everyone. 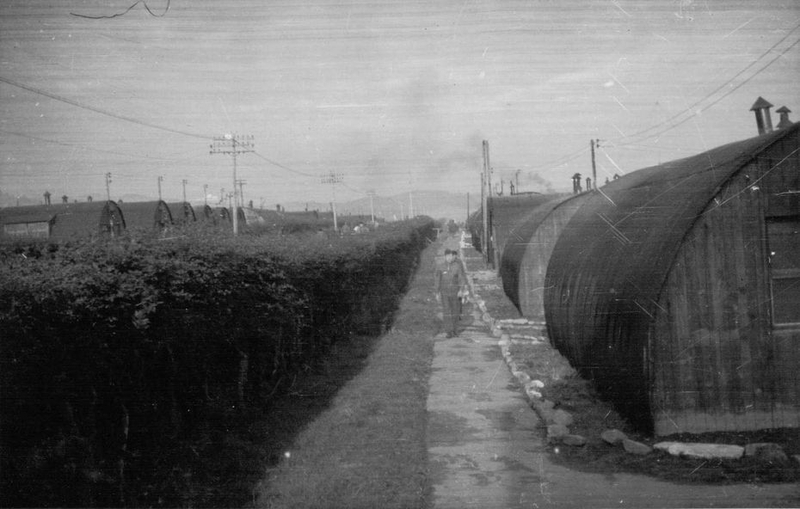 Tucked away up Coyles Lane at Ballyrobert was a small factory in which shell casings were produced. This was one of a number of small factories in the area which played their part during the war with another factory nearby producing recoil gear for Bofors Guns as well as aircraft components. 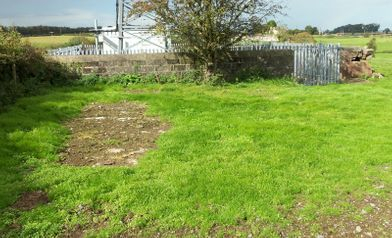 This picture shows what remains of the Coyles Land factory. On 15th May 1941 Permission was granted by The Ministry of Home Affairs for a Bombing Range on the Eastern Side of Strangford Lough. 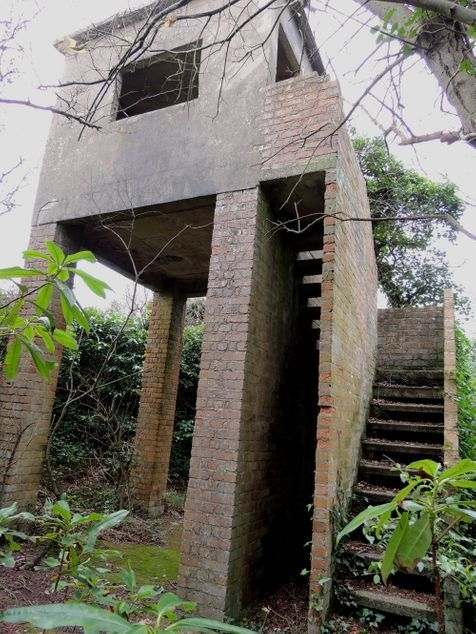 This Bombing Range Quadrant Tower can be found on the shoreline beside Mount Stewart. 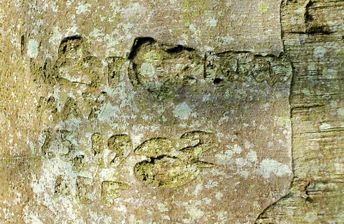 Some remnants of the original cream and light blue paint remain to be seen. 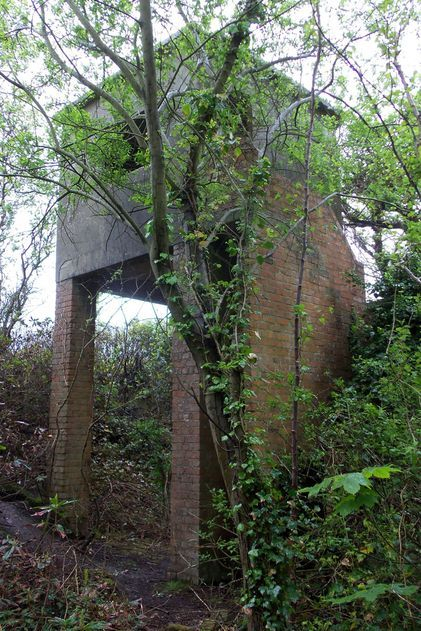 The tower would have been used to record the success of aircrews involved in Bombing Practice on the range. There is a small store underneath the steps. 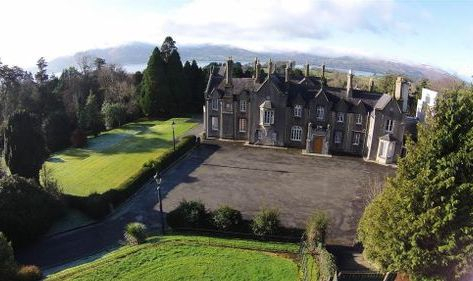 I have a copy of a "Headquarters Flying Training Command Range Index" which identifies this range as "Mount Stewart" with control at Bishops Court. The danger area of the range was 1000 yards and the radio callsign was "Stewart". The range was only available for daylight use and had a triangular yellow target. 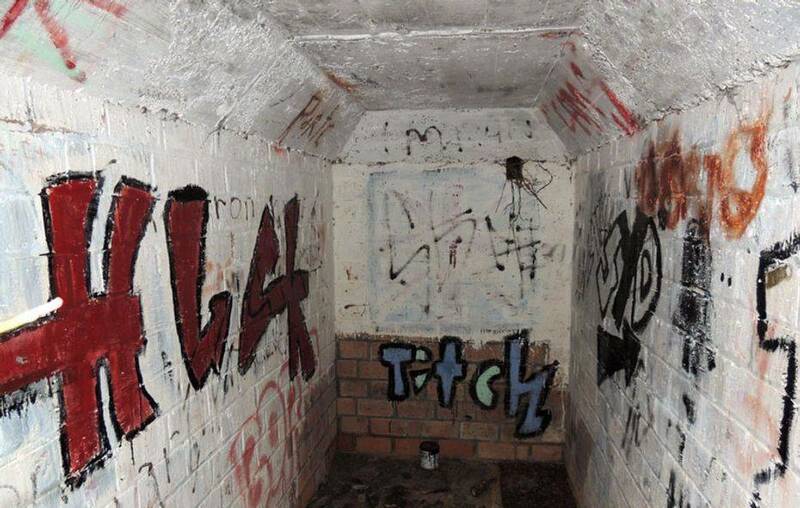 Shown above is a view inside the Tower and there are still traces of the Cream and Light Blue paint which had been used. The wording and measurement is on a concrete section of the building. 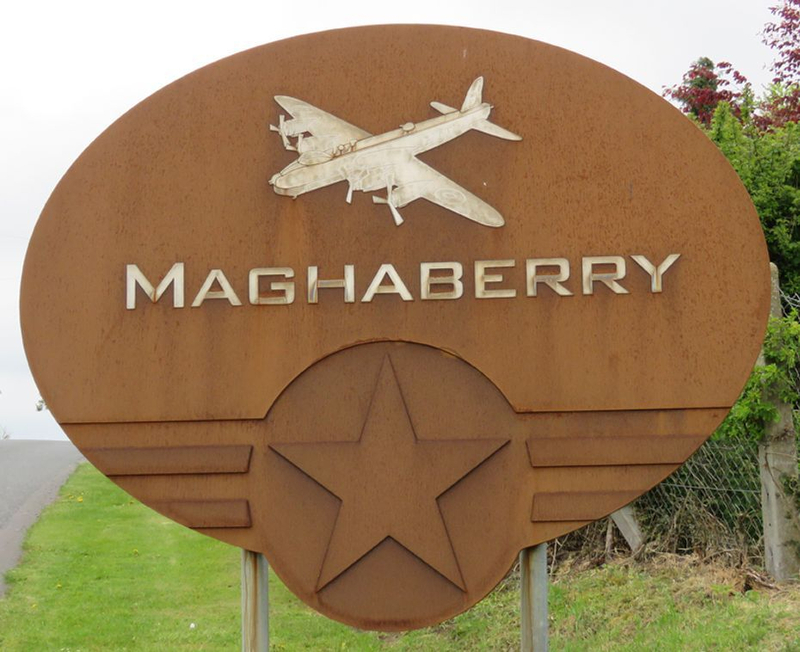 The Royal Air Force Air Operations Block for Ballyhalbert Airfield was located a short distance from the Airfield in the grounds of Tubber Na Carrig House on Tubber Road in Kircubbin. 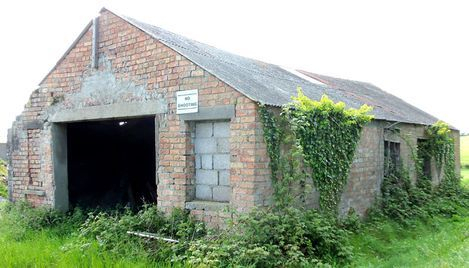 Sadly that building was demolished some years ago however this building can be seen at the entrance to the field directly opposite and I suspect it may have had a direct connection to the Air Force personel at Tubber Na Carrig House. Sergeant Robert Valentine Ievers was on board Douglas Boston Mk III, Z2165 on the night of 30th November / 1st December 1942 operating over Western Flanders in Belgium. This was a combined Intruder and Leaflet Dropping operation code named "Nickle" when the aircraft was lost. 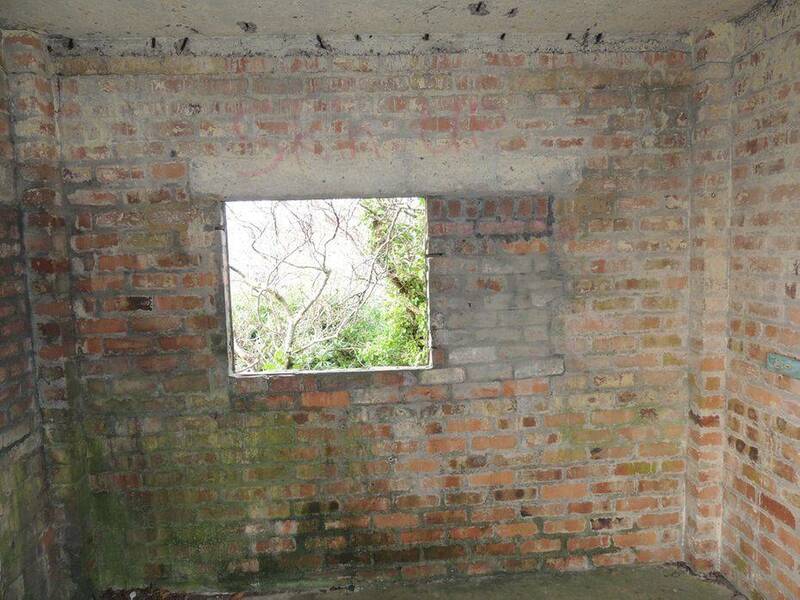 Shown here are what remains of an Anti-Aircraft Gun Battery which was positioned in Carryduff. 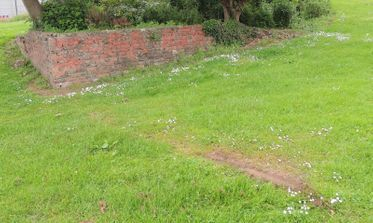 There are the remains of 3 buildings which were part of this Battery used as defence for the City of Belfast. 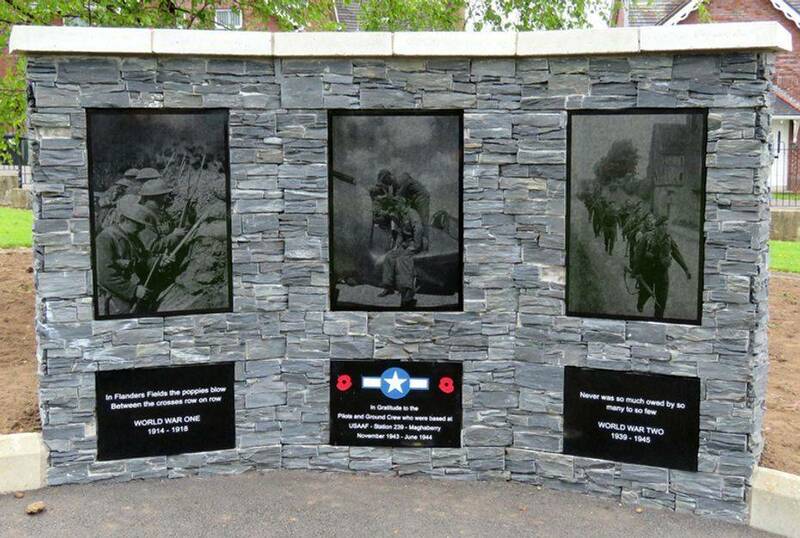 You can find these in Carryduff Park. Gibraltarian Evacuee Camp, Cargagh Cutts. 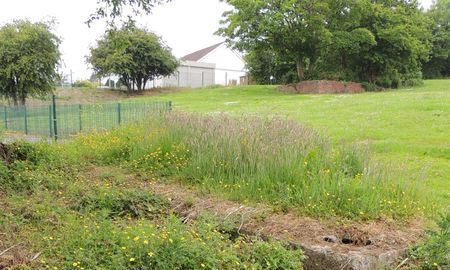 These buildings are what remains of the Gibraltarian Evacuee camp which stood at Cargagh Cutts between Downpatrick and Clough. 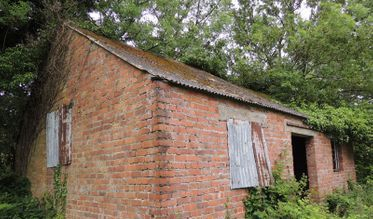 The red bricked building is a regular site at these Camps and on this occasion it has been converted to serve as a Summer House. 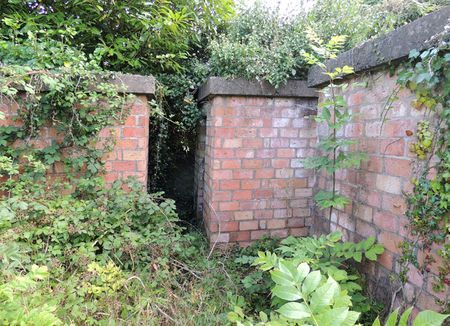 The picture on the right above is one of 2 Toilet Blocks which remain at the site. 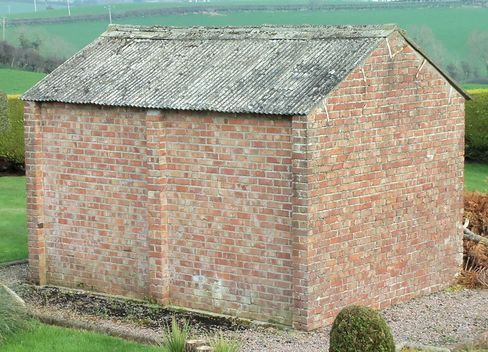 My favourite find here is the wording on the side of one of these toilet blocks that is shown here. 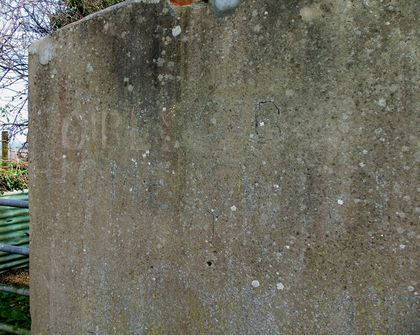 The faint word "Girls" has been painted in red and on looking closely you can see "Gib" beside Girls and below this "Home" and possibly "Swiftly" or similar as time has taken its toll. 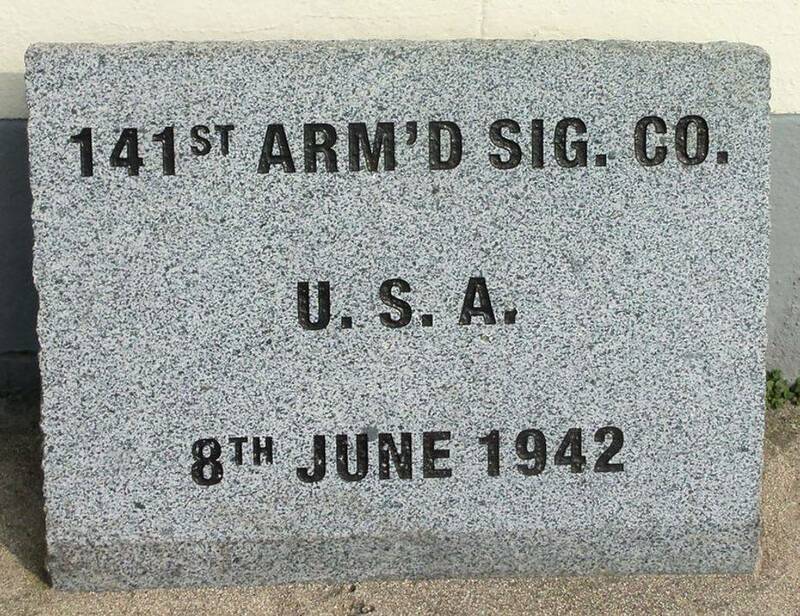 This Memorial Stone to 141st Armored Signal Company United States Army can be seen at Upper Square, Castlewellan. 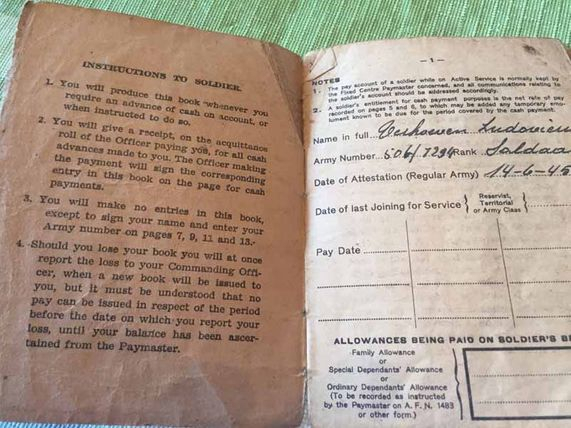 Company E of 16th Armored Engineer Battalion 1st Armored Division arrived in Dundrum in 1942 and between 10th June 1942 and 28th October 1942 there was also a Headquarters and Headquarters detachment 1st Armored Division Trains. 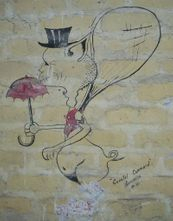 Fortunately for me soldiers always seem to enjoy leaving their names where they have been and here is another example. 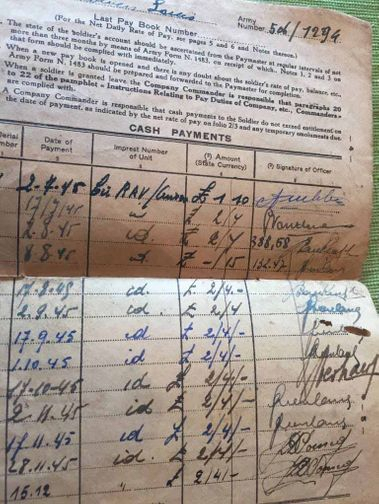 I cannot make out the name however the date is "MAY 23, 1942" with A.E.F. 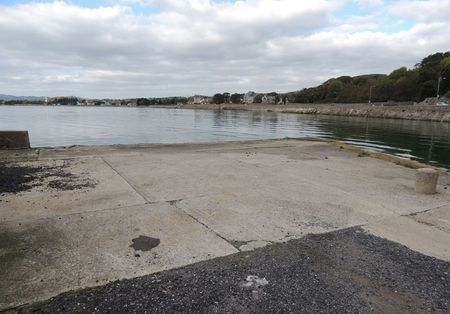 below which I would expect means "American Expeditionary Force"
The picture above shows Dundrum Camp as it looked after the war when it was being used as a Holiday Camp - Dundrum Castle can be seen in the background. 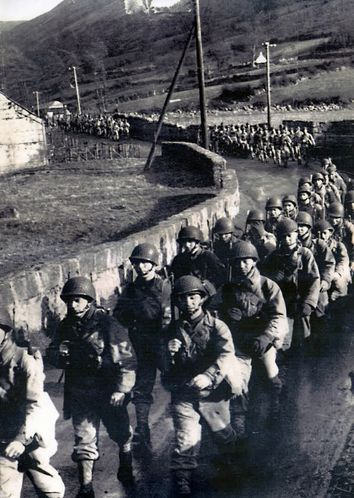 Shown on the left is 1st Platoon, Company G of 1st Infantry Division, United States Army marching along Newtown Road, Rostrevor at the end of a three day Exercise in the Mourne Mountains in 1944 with my photograph shows the same scene today. 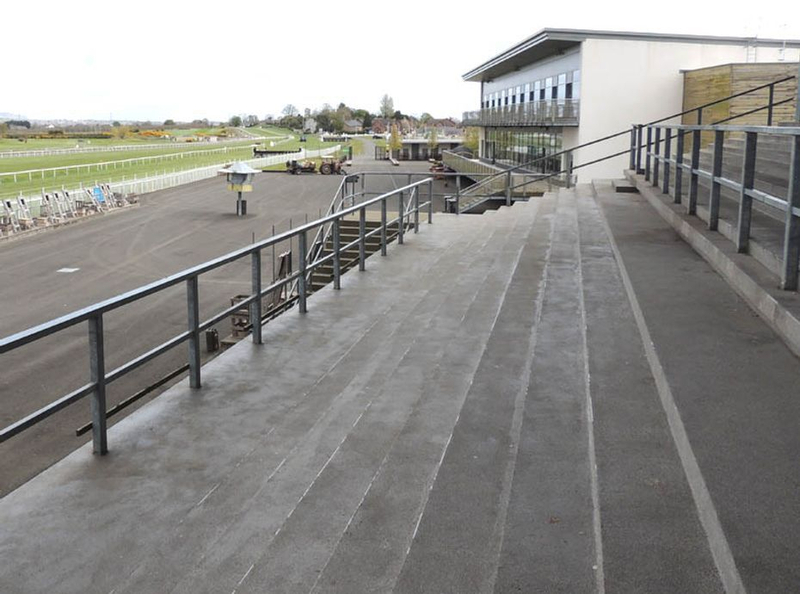 The lower photograph is from a slightly different angle. 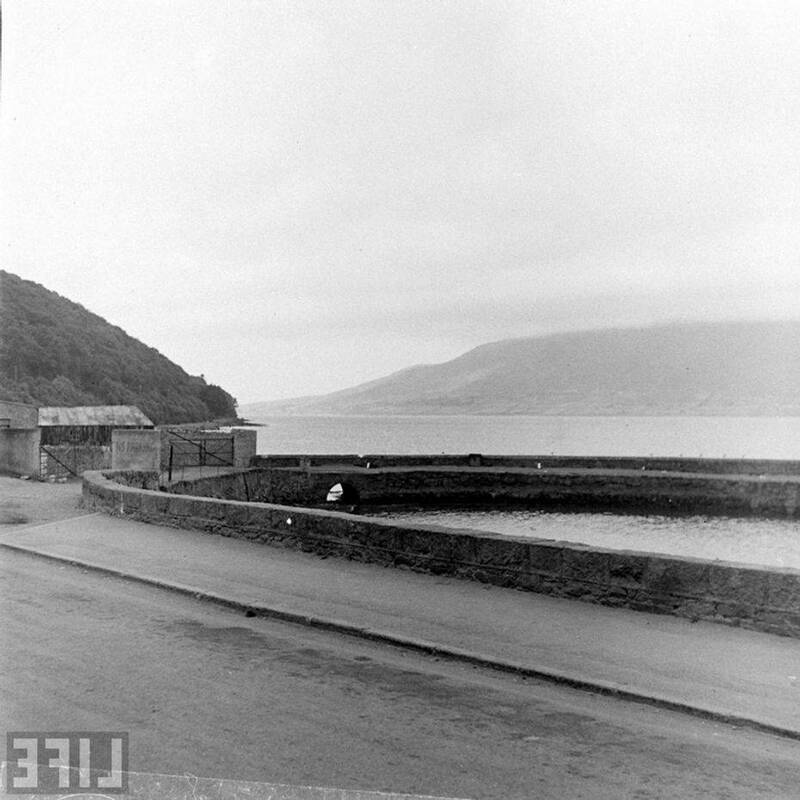 On 11th July 1941 a Training Exercise involving the 3rd Battalion, Monmouthshire Regiment was to take place off the Shore Road, Rostrevor which was to be observed by a senior Officer. 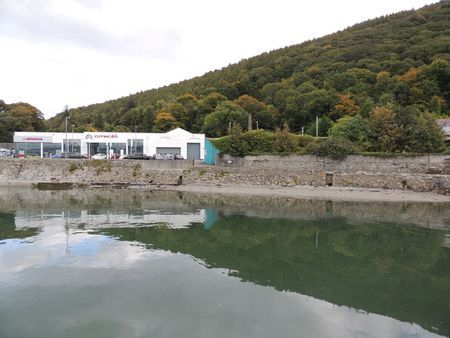 A total of 16 men were sitting in a boat approx 75 yards from shore and when the Exercise commenced they were to get into the water of Carlingford Lough and practice going ashore as if in a beach landing. All the men were wearing full Battledress including Helmets and carrying their Rifles. The soldiers had been in the boat since 2pm and were cold and damp when the senior Officer arrived two hours later and the Exercise commenced at 4pm. The boat owner, Danny Tinnelly later commented that “Someone should have realised they were too cramped to go into the water” however in they went on the signal from their Commander and the inevitable happened. With the soldiers weighted down with uniform and equipment, cold and cramped from the hours sitting in the boat they had no life preservers when they jumped into the deep water. 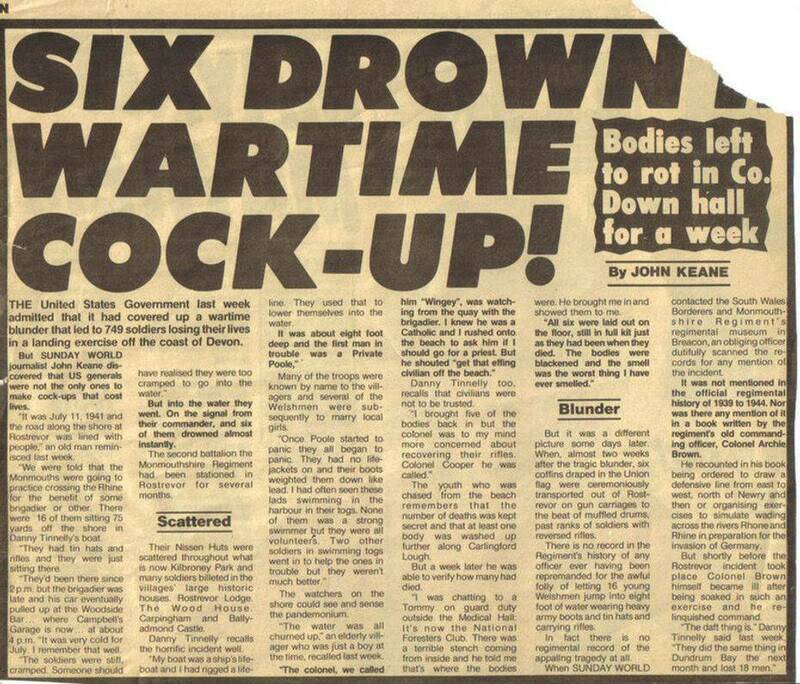 The first six men were seen to be in difficulties and struggling to get safely to shore but sadly all six were drown. 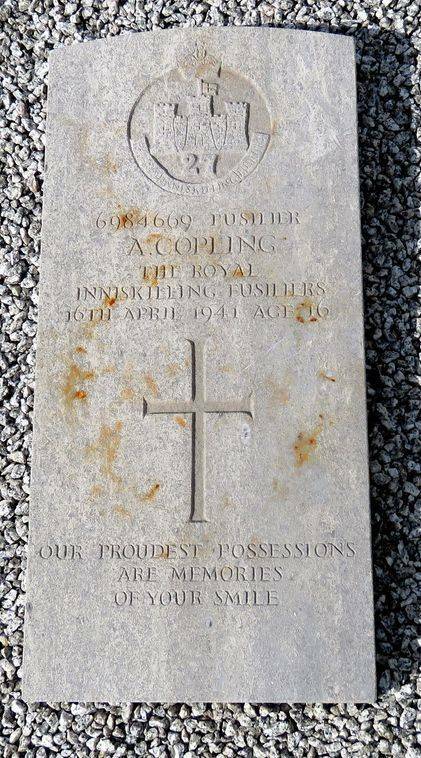 Danny Tinnelly recovered five of the bodies however it appeared to him that Cooper was more concerned about the recovery of the soldiers rifles that the men who had been killed. Several days passed and all six victims were still laid out on the floor of the Medical Hall where they had been brought. Each was still wearing his uniform from the day of the tragedy and decomposition was beginning to take place. 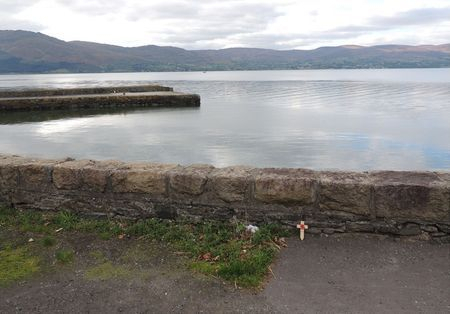 Finally the six Union Flag draped coffins were transported with full military honours out of Rostrevor on 16th July and onward to Belfast for repatriation back to Britain. Corporal Raymond Mort, 23 years. Lance Corporal Francis Joseph Cannon, 21 years. Private Haydon Thomas Jones, 21 years. Private Clive Lamb, 22 years. Private William Alden Morris, 31 years. Private Leo Patrick Poole, 37 years. 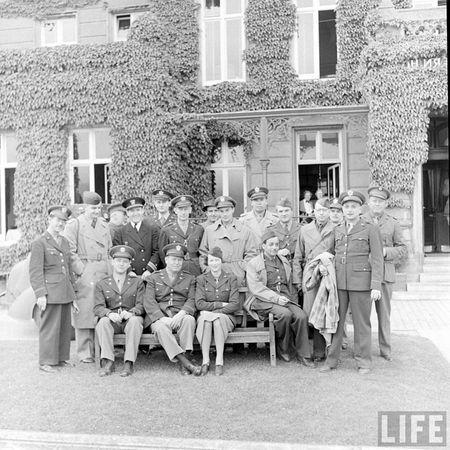 Members of the 10th Infantry Division, U.S. Army were based here from October 1943. The Unit consisted of 2nd Battalion and 3rd Battalion with Headquarters with Headquarters Company for each along with Companies E,F,G and H of the 2nd Battalion and Companies I,K,L and M of the 3rd Battalion. 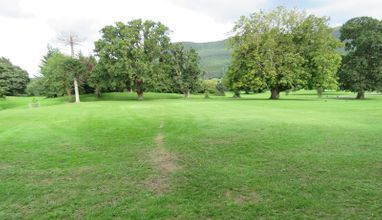 The land is now owned by the Ballyedmond Estate and access in not permitted. 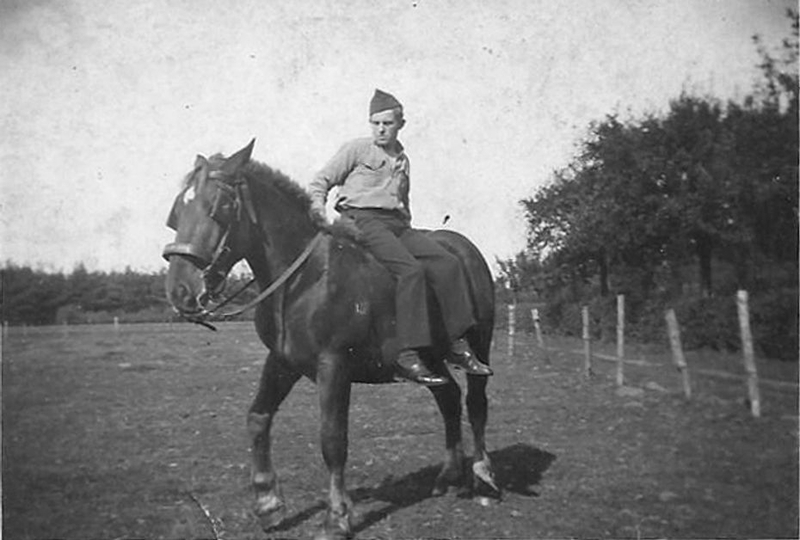 John D. McCory of Missouri was an enlisted man in the Missouri National Guard 35th Division mobilized for WW2 in 1942. He attended Officer Cadet School and later Flight School at Ft. Sill Oklahoma as a Liaison Pilot flying the Piper L-4 Artillery Spotter before being reassigned to the 144th Field Artillery Group with whom he deployed to Northern Ireland with in 1943. These black and white photographs are from John McCory. It is pleasing to report that John survived the war flying very dangerous missions in his spotter plane to include the Battle of the Bulge. In the last week of the War was given credit for finding the King of the Belgians who the Nazi's had incarcerated near Austria. As a 22 year old Captain by the time of the War's end he was responsible for his groups aircraft as well as other Artillery Battalions spotter planes in an Army Corps. He was awarded 2 Bronze Stars, a Distinguished Flying Cross and is listed in the Field Artillery "Hall of Fame" at Ft. Sill Oklahoma! John left the Regular Army after the war but joined the Missouri National Guard and rose to the rank of Colonel before his retirement in 1975. 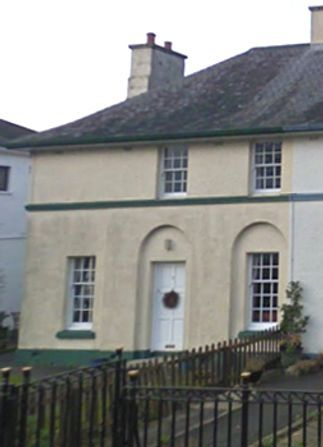 In 1940 Ranfurley House at Mary Street / Shore Road in Rostrevor was used by 3rd Battalion of the Monmouthshire Regiment. This photograph shows Maggie McGivern and Mary Duffin standing outside the old Royal Ulster Constabulary Station in Mary Street, Rostrevor. They are with British Soldiers who may have been Monmouthshire Regiment based a short distance away. 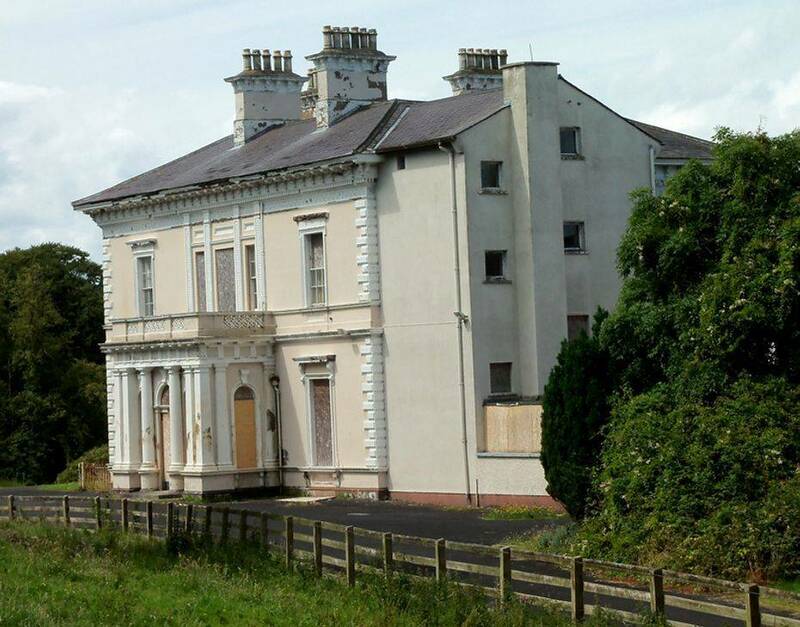 Rostrevor House on Greenpark Road, Rostrevor was used by the United States Army during the Second World War. 2nd Infantry Regiment of 5th Infantry Division were there and there were some Nissen Huts constructed within the grounds. 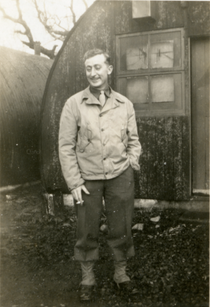 "Private First Class John Diehl having a smoke, Rostrevor 25 February 1944"
The photograph was taken my Technician Third Grade Joe Powell, who served as a medic in the 2nd Infantry Division in the European Theater of Operations. Joe Harold Powell, M.D., was born on 15 February 1916 in Pine, Texas. He moved to Shreveport, Louisiana, in 1938, before enlisting in the United States Army on 10 April 1942. 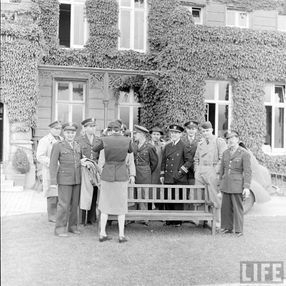 The 2nd Infantry Division was sent to the United Kingdom to prepare for Operation Overlord in October 1943. 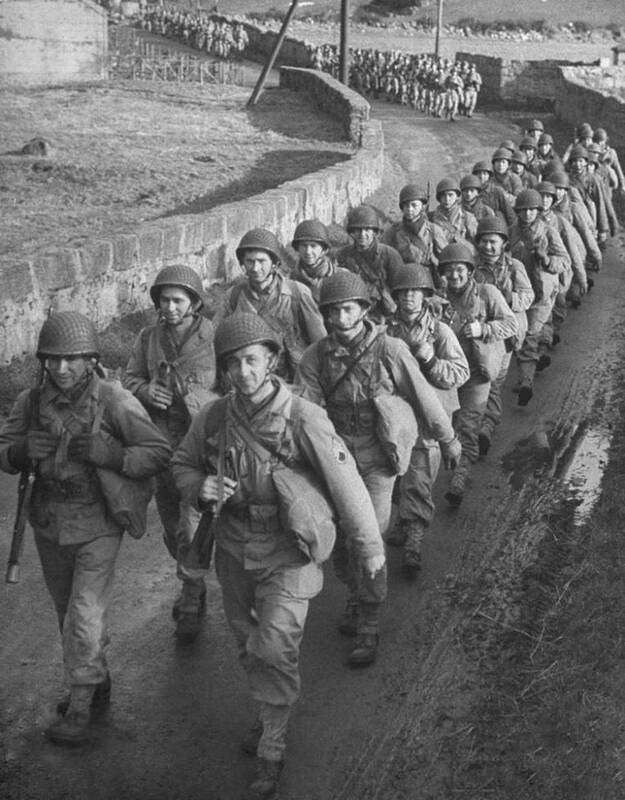 The division landed on Omaha Beach on 7 June 1944 and continued through France, participating in the Battle of Brest. In October, the division entered Germany and remained there until May 1945. It then entered Czechoslovakia before returning to the United States in July. After the war, Powell earned his M.D. and moved to Mississippi. He remained there until his death on 22 July 1987 in the city of Bay St. Louis. 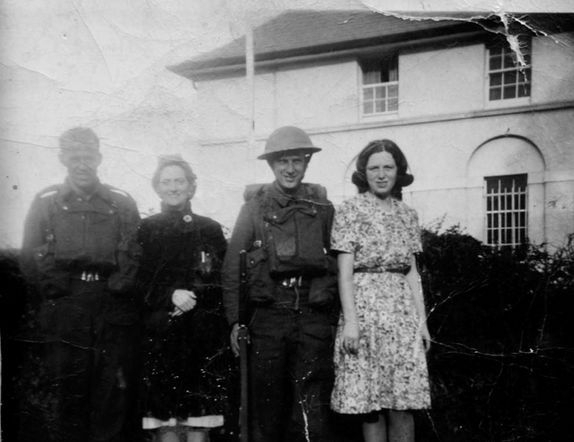 This photograph is from a collection of items include a 2nd Infantry Division patch and photographs of Powell’s time in New Orleans, Northern Ireland, England, France, Switzerland, and Germany. 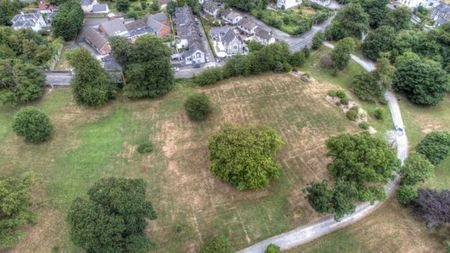 With a spell of dry weather during July 2018 evidence of a Second World War Camp appeared in Kilbroney Park as referred to in the article you can watch with the link below. My photographs below show the same location from ground level. 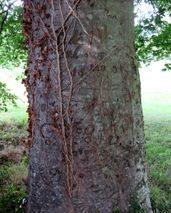 There are some carving in the trees however they are difficult to read as can be seen in my picture below. 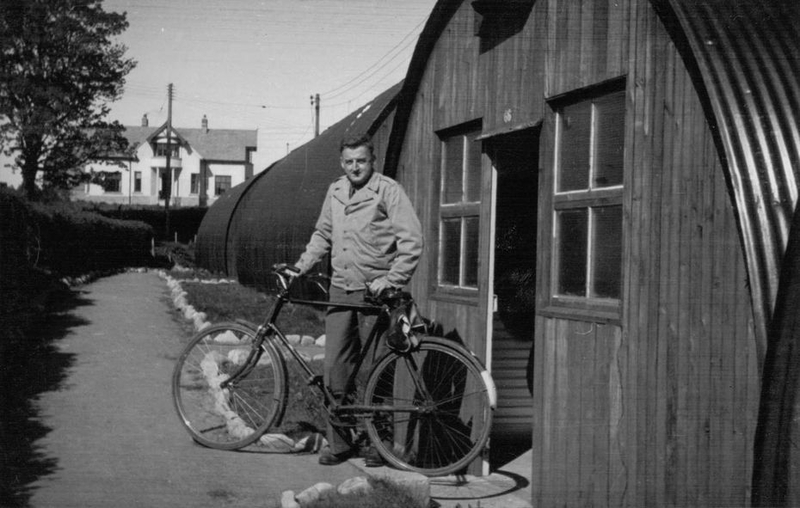 This picture shows nissen huts at a large Manor House which was being used as Quarters by 2nd Infantry Regiment, 5th Infantry Division. 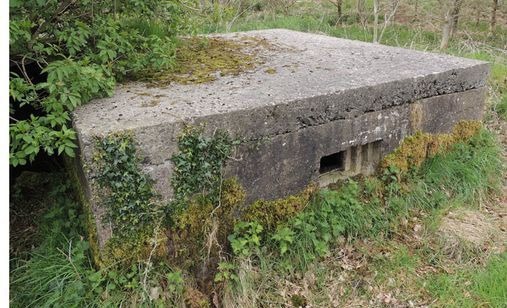 I believe the pillbox which is shown here is what was known as a Type 22 Pillbox. 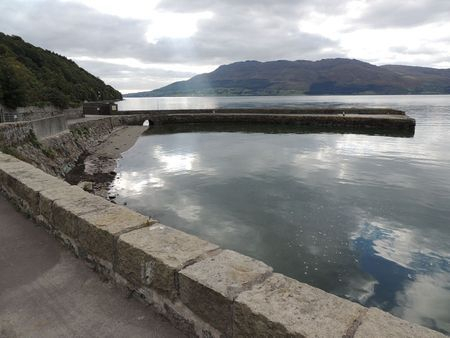 It is situated on the eastern side of Tyrella Beach and has a commanding view. The original door as well as a few of the metal shutters remain. Great example. 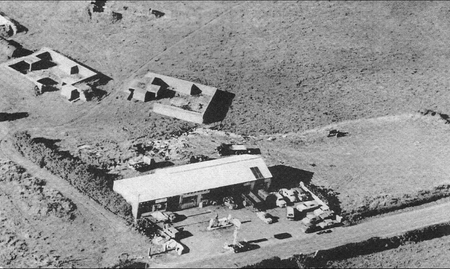 This is an interesting position which has been made up of a group of buildings as well as what appears to be a concrete parking area for vehicles beside the small hill on top of which is the Gun Position. 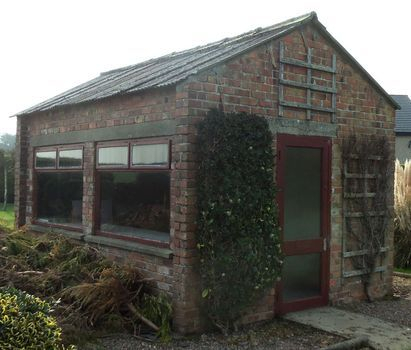 Beside the road has been a red bricked building which has now been converted to a farmer's animal pen. The concrete lane where vehicles would have parked also shows the bases of two buildings. There is one singular structure on which have been constructed four separate gun positions. 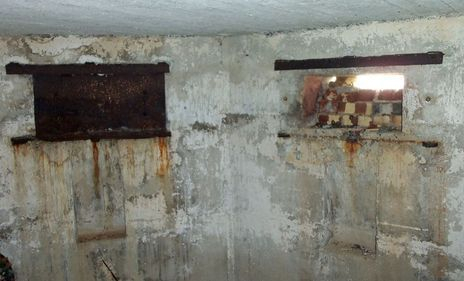 These appear to have been surrounded by a concrete wall of which only 2 complete sections remain at one of the gun positions as can be seen here. 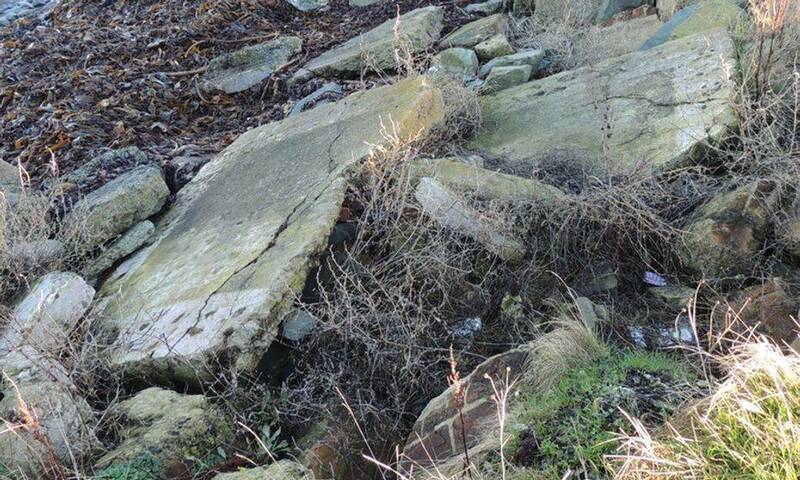 Another photograph shows one of the gun positions with all of the concrete walls broken outwards almost flowerlike. I am aware of some U.S. Army Personel having used this range. 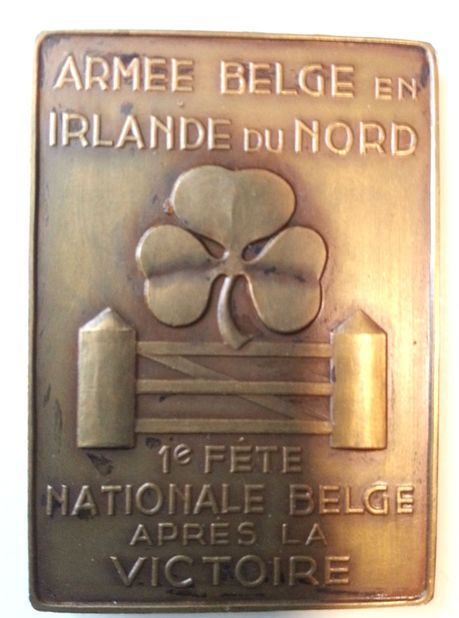 The 898th Anti-Aircraft Artillery Battalion (Automatic Weapons) arrived in Northern Ireland on 19th May 1942 and stayed for a short time before going to Liverpool on 10th December 1942 from where they deployed to North Africa. The U.S. Army 8th Infantry Division also used this facility. In this final picture St Johns Point Lighthouse in in the background and I hope you can make out all 4 of the gun positions within this structure which was used towards the end of the Second World War for Practice Firing by 18 Royal Artillery. 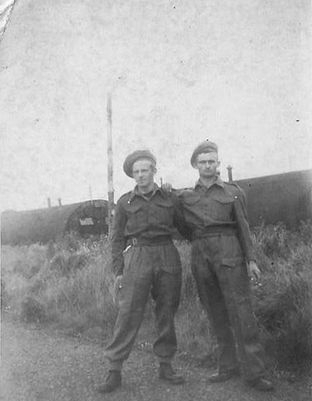 Gunner Alf Sear is shown on the right. Belgian Soldiers were based here in Seapatrick. 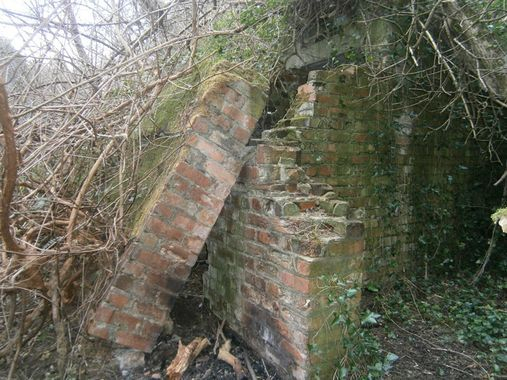 The Soldiers lived at Kiln Lane and I believe these old buildings may have been used. 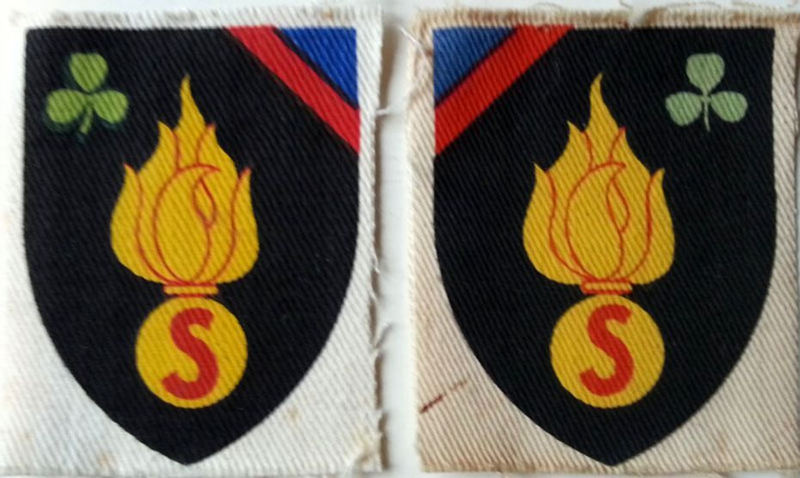 The Unit concerned was 4th Infantry Brigade known as "Steenstraete" whose 1st Battalion were based at Union Camp as mentioned above. 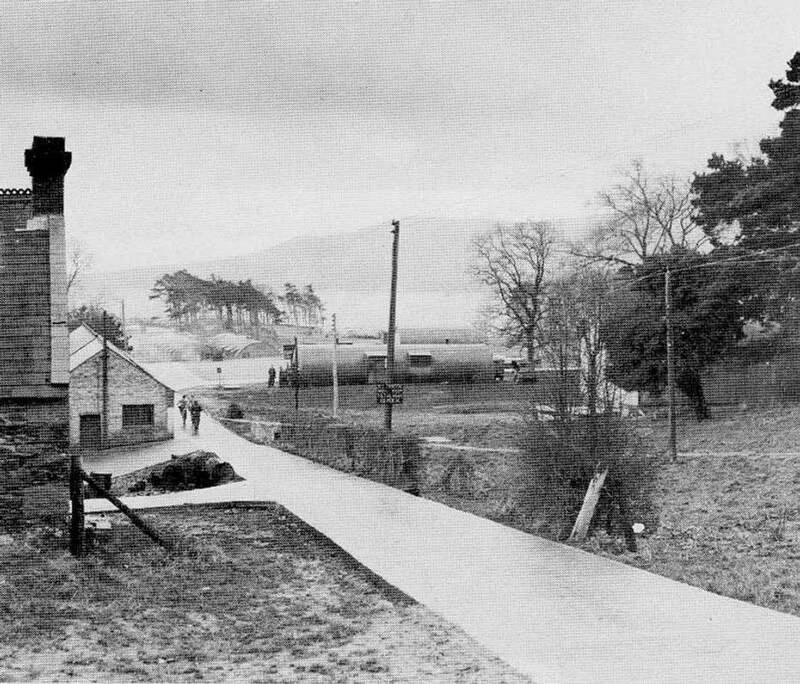 On the 6th and 7th August 1940 the Royal Air Force moved its Number 7 Mobile Oxygen Plant and Number 22 Wing Servicing Unit from Aldergrove to Gill Hall in Dromore. 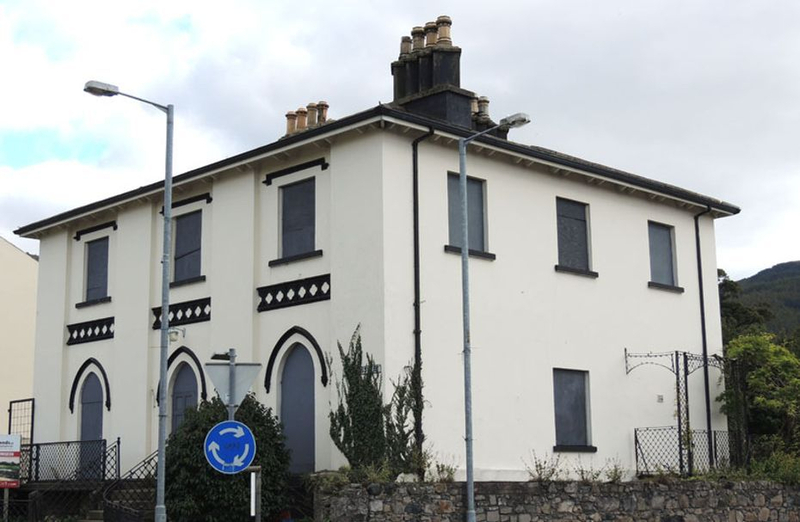 Sadly the building later fell into disrepair and was subsequently demolished. 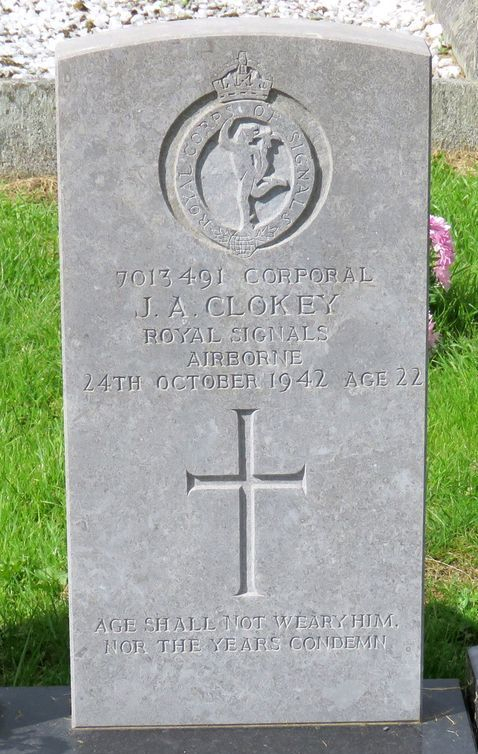 Corporal James Alexander Clokey was serving with Royal Signals Airborne when he died on 24th October 1942. 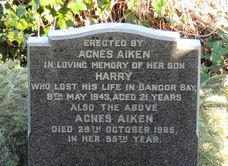 He was the Son of John and Agnes Clokey. Sergeant Jane Grant Beggs, Number 889112 was serving with the Womens Auxiliary Air Force when she died on 2nd october 1944. 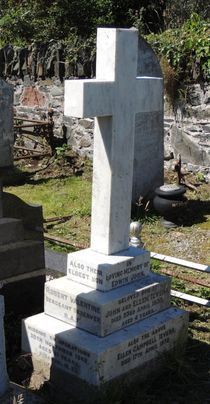 Corporal John Mercer Ward is Buried at Dromore 1st Presbyterian Church. 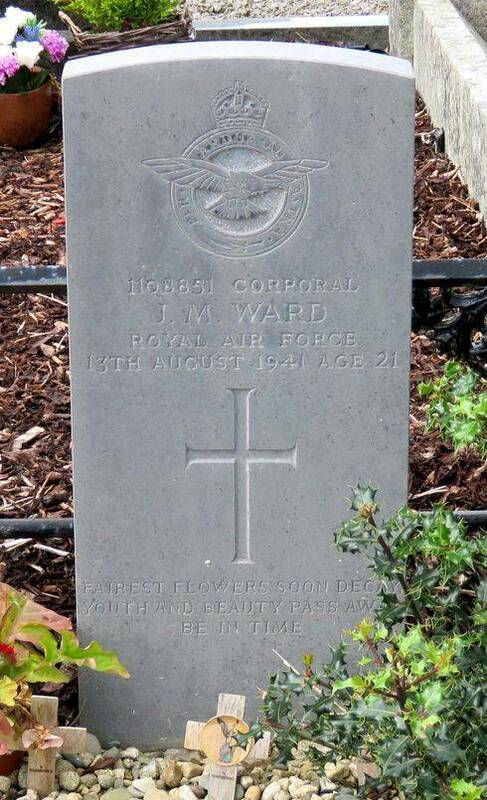 He was serving with Royal Air Force Volunteer Reserve and was 21 years old when he died on 13th August 1941. He was the Son of Samuel G and Elizabeth M Ward of Dromore. Company A and Company B of 7 Engineer Combat Battalion, United States Army were based in Magill's Field which is recorded in the "W.B.S. 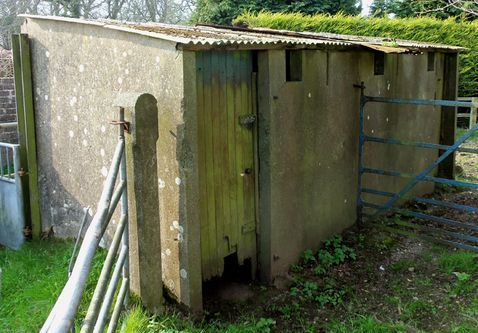 Troop Accommodations Northern Ireland District" List as having a capacity of 362 troops. I believe that "Magill's Field" was on Blackbridge Road, Poyntzpass however I have been unable to confirm this. 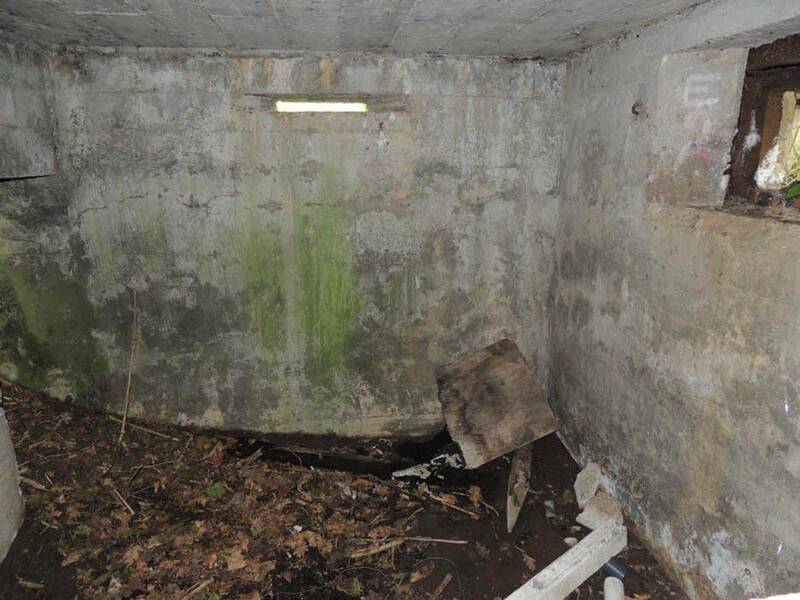 This is the Control Shelter for a "Starfish" Decoy site at Creightons Wood near Holywood. The building is a single room with protected entrance. 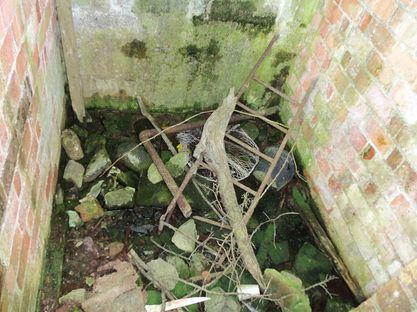 The photohraphs show the escape hatch in the roof - to which had originally been a metal ladder and to the left of the hatch is the hole where the chimney of a small stove would have gone through. 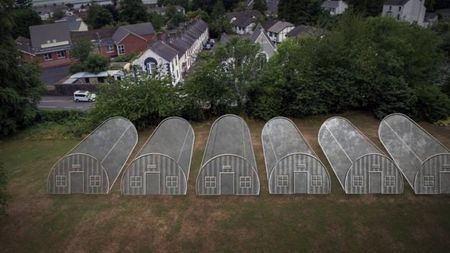 The idea of such sites was that when there was an Air Raid fires would be lit over an area close to this shelter with the hope that bombs would be dropped here rather than the intended target. 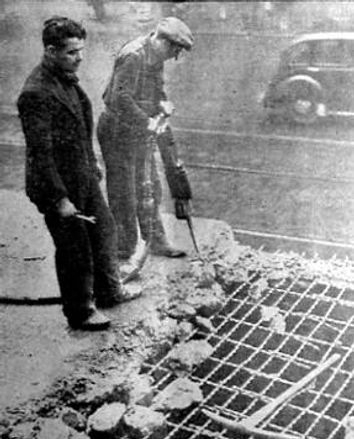 In this case I suspect that the purpose of this site was to protect any planned bombing of Palace Barracks which is only a short distance away and was busy during the war. 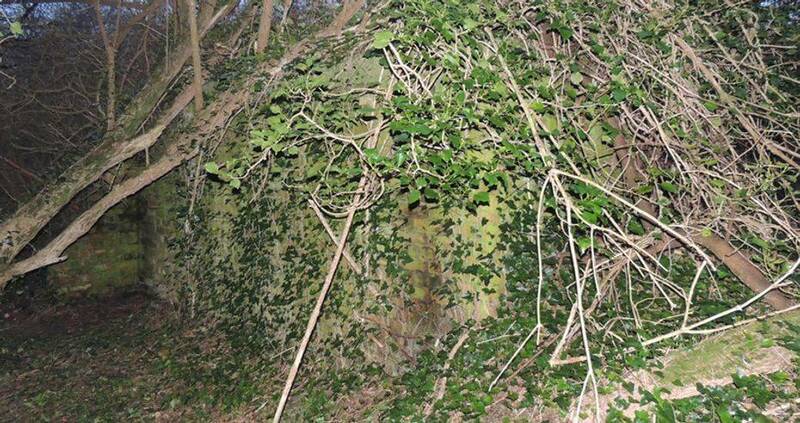 Underneath all this undergrowth is another Shelter at the Creightons Wood Starfish Site. The outer blast wall has collapsed onto the structure making access difficult. On looking inside the walls and roof appear to have all been painted white. When approaching Site 1 take the path to the right and where is starts to bend go into the woods on the left side of the path where you will find this shelter. 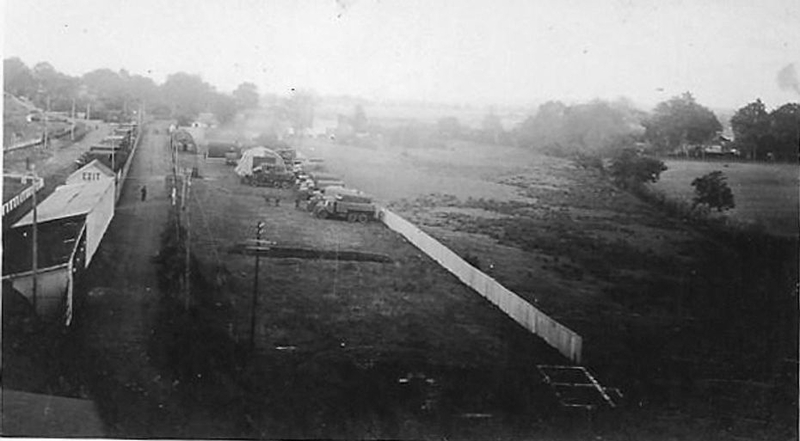 The first photograph above shows Belgian soldiers and Nissen Huts at Maze Race Course. - The Belgian Flag is clearly visible in the picture. 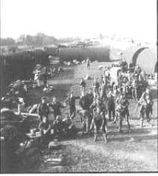 Belgian soldiers of 6th Infantry Brigade “Deinze” Provisioning Company arrived at the camp in June 1945 and remained there until the end of November. British, American and Polish soldiers had been there previously however the camp had been vacant for approximately one year before the arrival of the Belgian Soldiers. Shown directly above are some of the Belgian Army Officers photographed in their camp at the race Course. Below is a picture taken from the Grandstand showing some Belgian Soldiers as well as their Trucks. 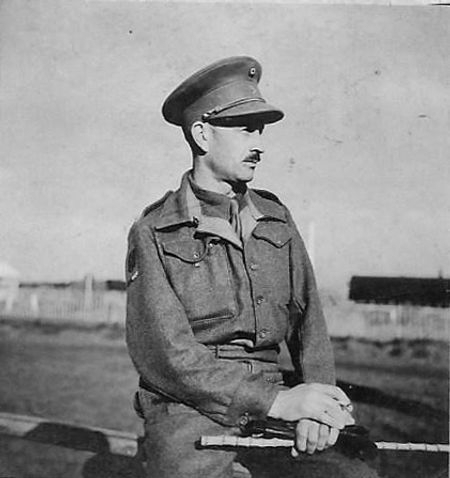 Shown above is Ludovicus Verhoeven of 6th Infantry Brigade, Belgian Army in Camp at the race Course. He is also shown below on a Horse. These final photographs show Belgian Soldiers relaxing around Camp. 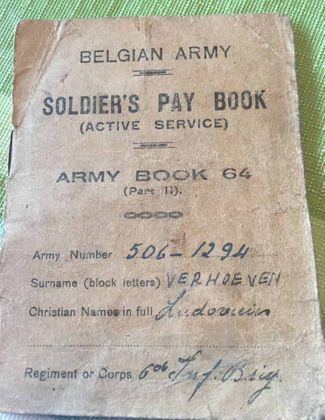 Belgian Soldiers in Northern Ireland "Pay Book"
Shown here is a Pay Book which had been issued to Ludovicus Verhoeven of 6th Infantry Brigade, Belgian Army. It is printed in English because at that time Belgium had been Occupied by the Germans and the Belgian Army was being re-formed in the United Kingdom. 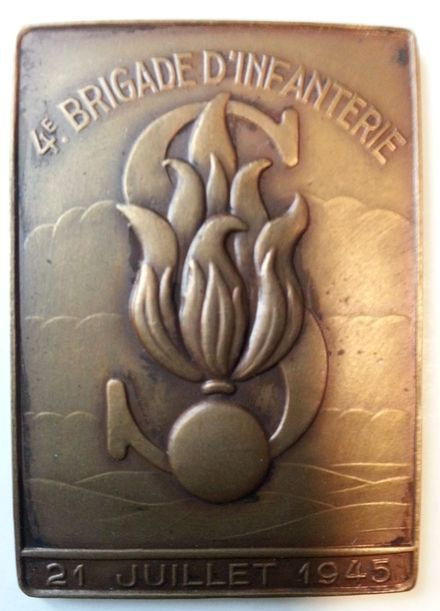 Praise for the Belgian Soldiers from Colonel I.H. Good D.S.O. 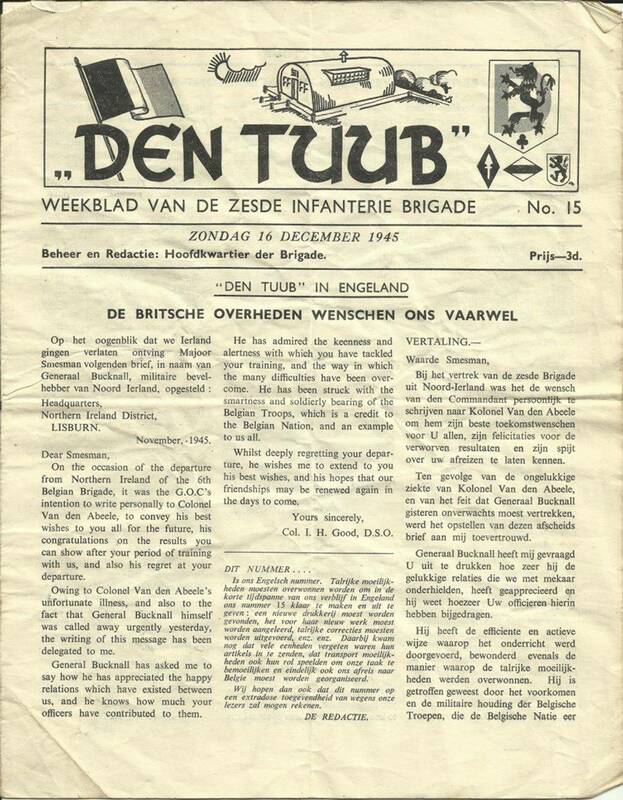 "Den Tuub" ("The Tube" - This refers to the shape of the Nissen Huts) was a weekly publication produced by 6th Infantry Brigade of the Belgian Army which was distributed during their stay in Northern Ireland in 1945. 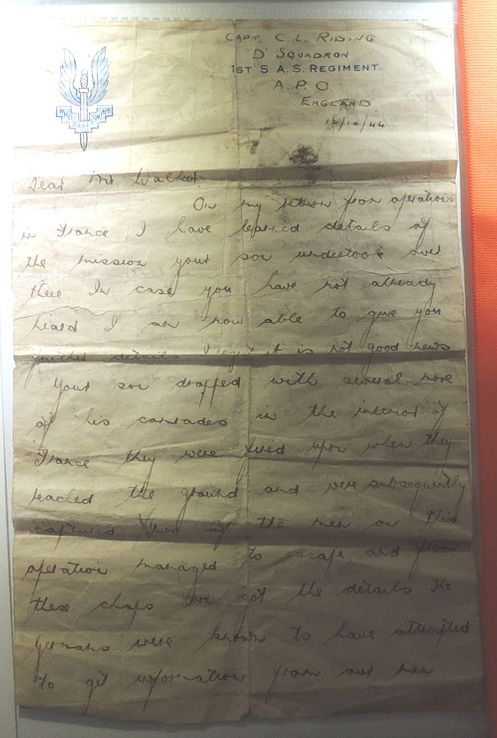 This edition includes a letter of appreciation to the Brigade from Colonel I.H.Good D.S.O. 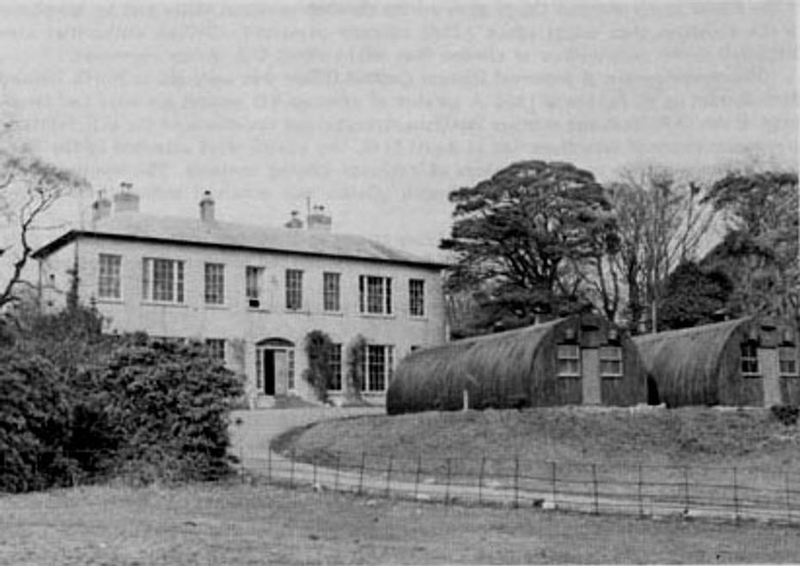 at Headquarters, Northern Ireland District, Lisburn dated November 1945. 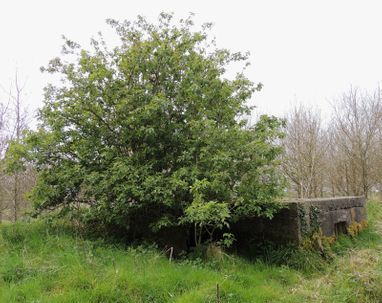 This Pillbox is at Down Royal Racecourse. It is interesting that as well as the Loopholes for guns there is also one Observation slit which is shown above. 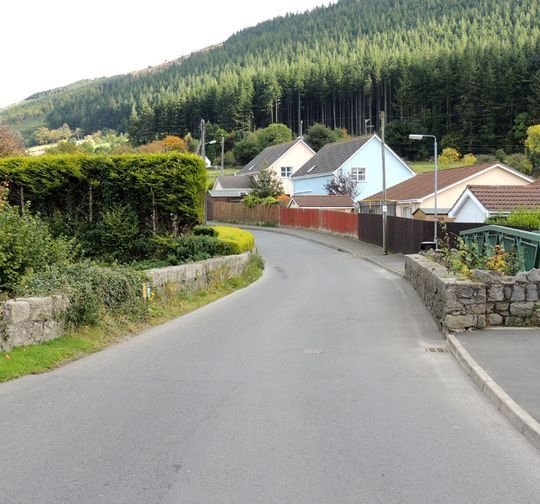 It is facing Gravelhill Road and in the general direction of what was Long Kesh. 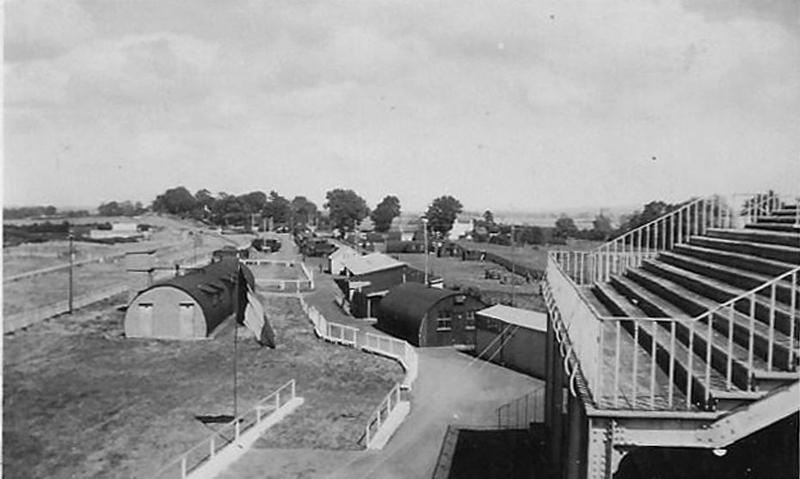 The entrance has a wall to protect users and the gun positions are pointing towards the Race Course on which there was the Camp shown above. The War Memorial shown above can be sen in Maghaberry village. Interestingly the picture on the right is of Royal Marines and the third in line is Corporal Richard Lewis Bashford of Number 6 Commando about whom you can read in the Information People Part 2 Section of this website. 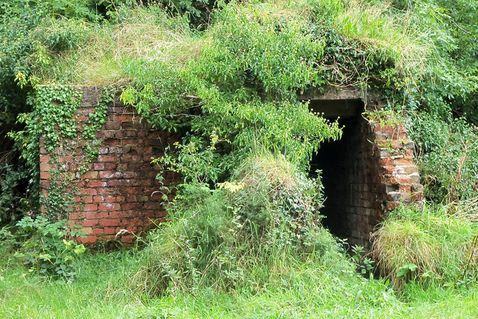 As with other areas such as Ballyholme and Groomsport the town of Donaghadee has some old broken up WW2 Air Raid Shelters as part of the sea defences. They can be seen along the shore from the harbour towards The Commons. 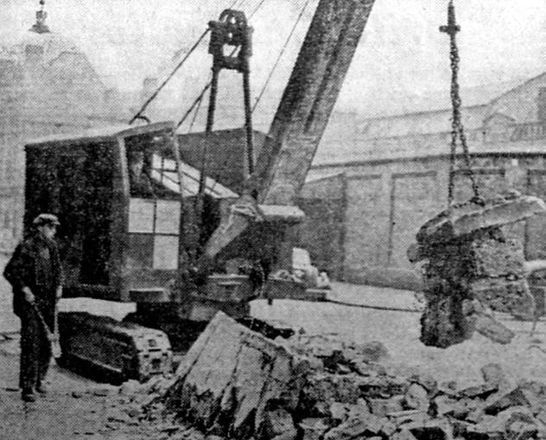 In this picture there are some red brick walls with the large concrete sections having been roof. 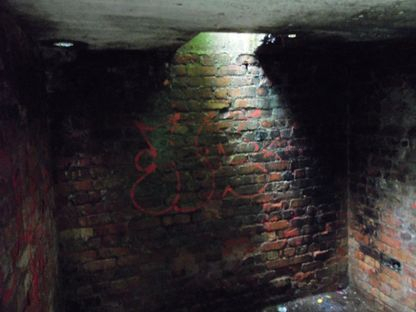 Having been constructed for the purpose of protecting people from Enemy Bombs the Air Raid Shelters were very sturdy buildings with lots of steel reinforced concrete. 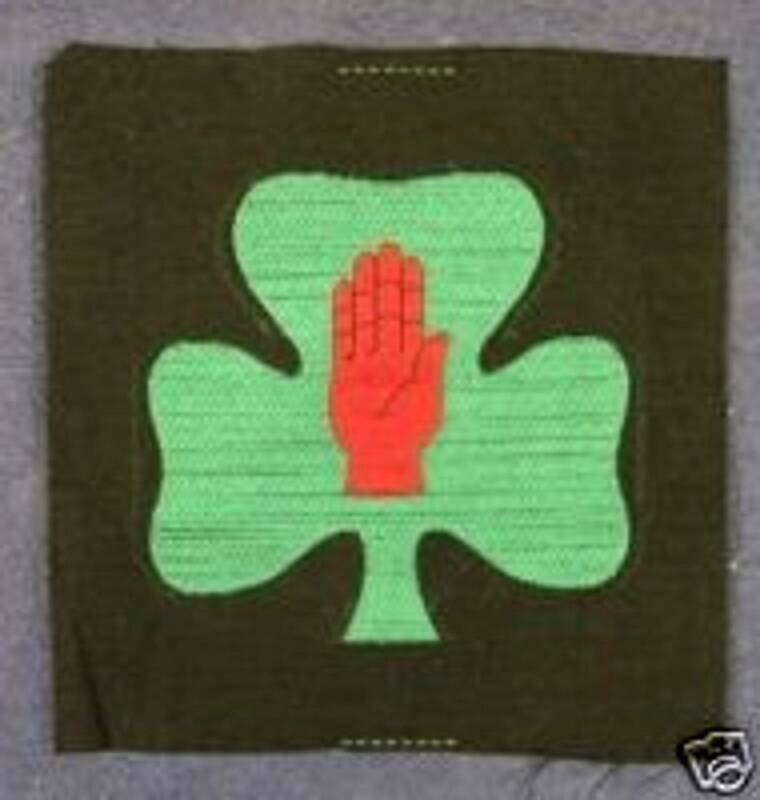 563 Quartermaster Battalion (Colored) 4049 Quartermaster Truck Company of the United States Army were based in Donaghcloney from 1st February until 6th May 1944. With racial segregation in the U.S. Army at that time these were coloured soldiers. I do not know the precise location of these Soldiers so if you have information that can help me complete this picture then please contact me!